Madeline is the smallest, but she won’t be pushed around! She has the heart of a lion. We estimate that she is between 12-16 weeks old. 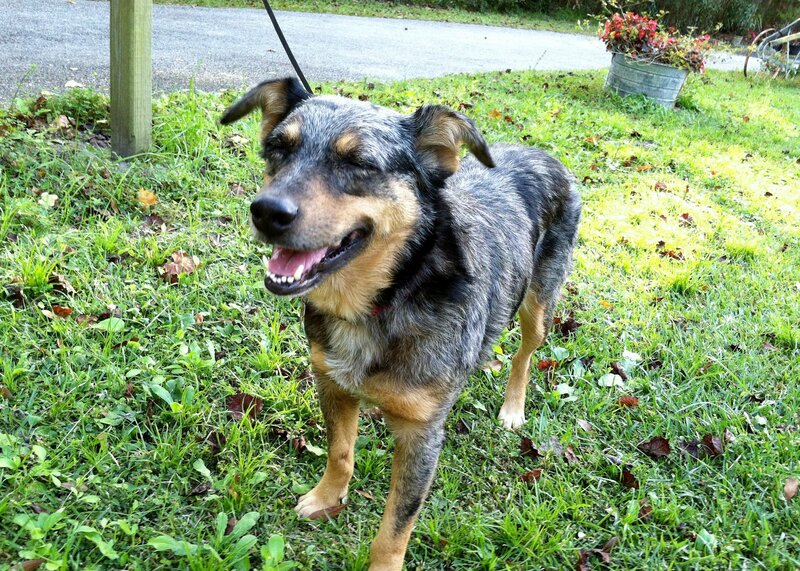 She is scheduled to be spayed/neutered on Monday, and will be available for meets after that. If you would like to be considered for Madeline, please go here to learn all about our adoption process. Also check out Madeline’s photo album and the litter’s photos on Facebook! Although we don’t use a traditional adoption application, we would like you to answer a few questions so that we can get to know you better. As we expect a lot of interest in these puppies, priority will be given to those who answer our adoption questions. The puppies are located in Deltona, FL. 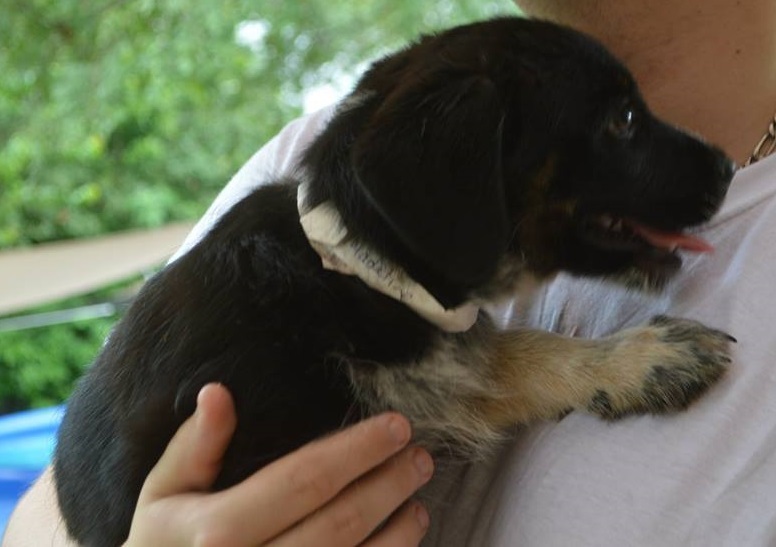 If you love the pups, but can’t adopt, please consider being a virtual foster! 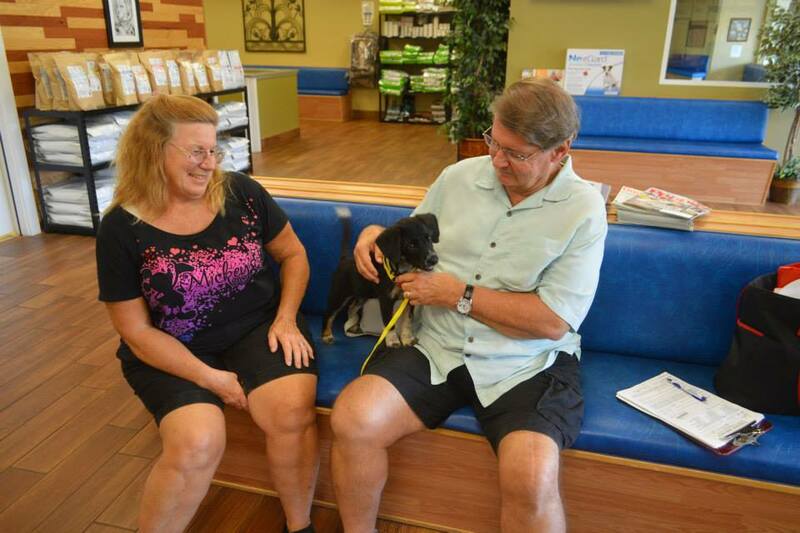 8/17/15 Update: Madeline was adopted by the Millers of Orlando. We’re so thrilled for them and for Maddie. Congrats, little girl! Throw it, throw it, throw it! 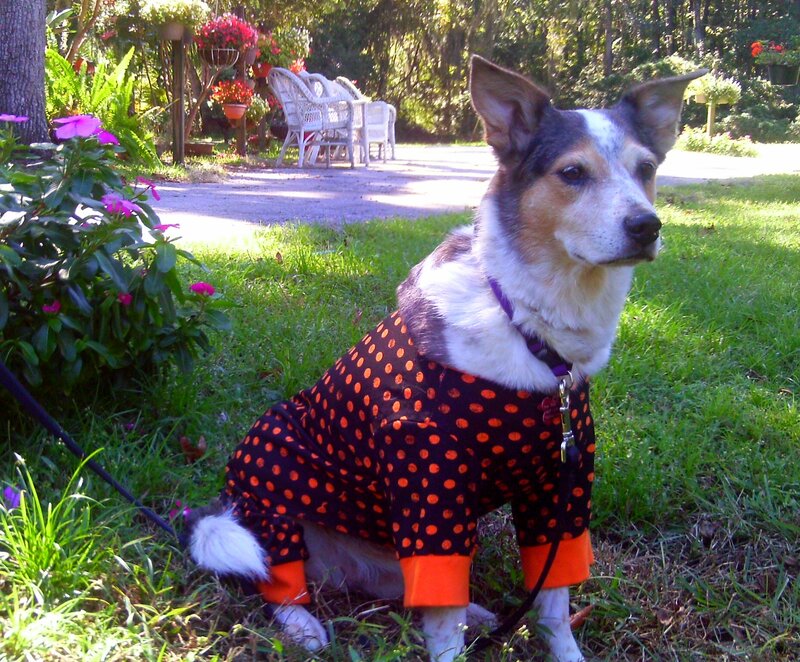 Lola is a performance dog… period! She is very young, and was found quite emaciated. Her foster Mom has nursed her back to health quite nicely! Lola had an un-diagnosed issue with her pancreas. We’ve seen it before, no biggie. Sprinkle some enzymes on her food and she’s fixed forever! We’ll be providing more information about Lola shortly, but in the meantime, she is about 1-2 years of age, and only weighs 30 pounds! She can scale a baby gate without effort, has great toy drive and loves playing frisbee! We’re working on better photos and a video! 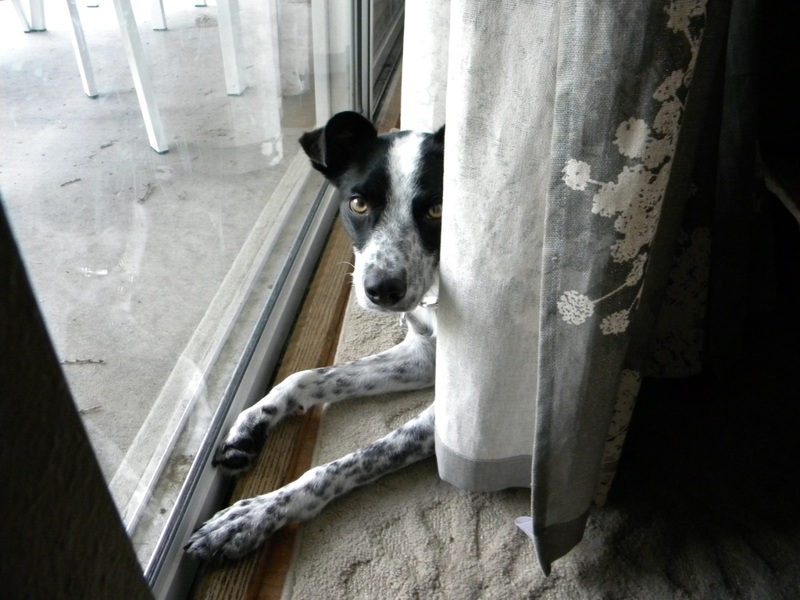 Can Lola go out and Play? 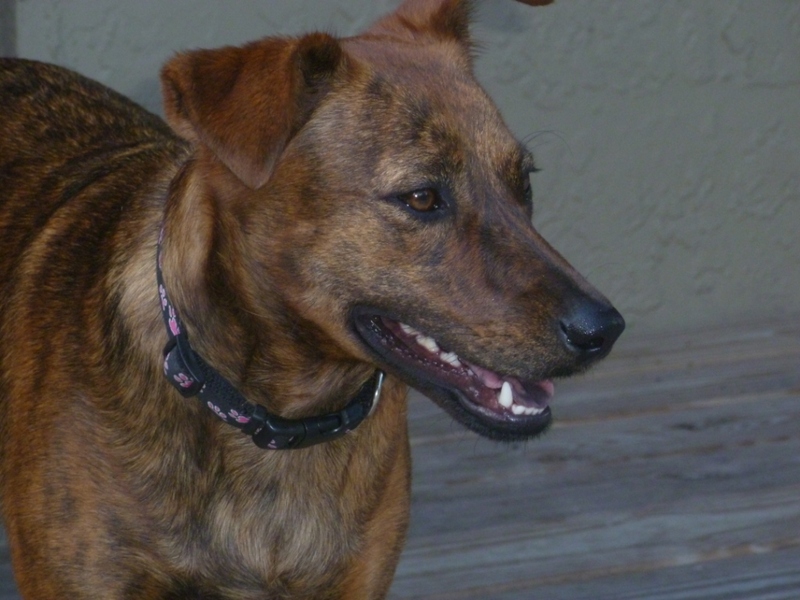 She is being fostered in the Orlando area. You can see more photos of her on Facebook. Email TheDogLiberator@gmail.com for more information on how to adopt. You can see her in action in the video below! Here’s a quick look at her wonderful manners! 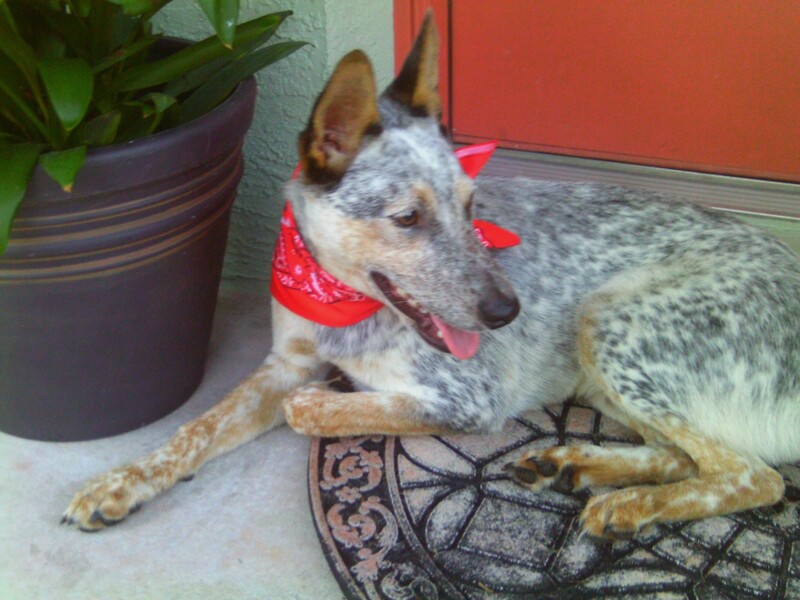 Jerry is a gorgeous 2 year old Australian Cattle Dog rescued from death from Miami Dade Animal Services. He is an outstanding pup, with so much love to give. He loves being with his human and furry companions. He is great with people, kids and dogs. He is potty trained, crate trained and wonderful on the leash. He is eager to learn and eager to please. 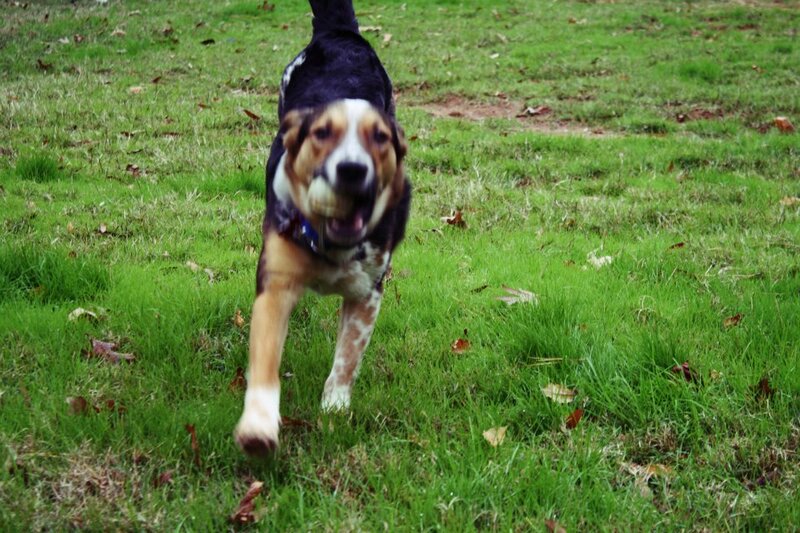 Jerry picks up on training extremely fast (something Cattle Dogs are known for). he would make a great addition to any family especially a family with children. He would make a great companion or service dog because he brings so much joy to those who meet him. He is an all around perfect dog that is grateful to have been saved. If interested in adopting Jerry, please email jackie.thedogliberator@gmail.com. You can see more photos of Jerry in his photo album on Facebook. and are you prepared to bring your new dog home if you are approved during your meet? have you or anyone in your family ever been bitten or traumatized by a dog in the past? and then we’ll go from there! The more you share the better! Well, Rammstein was delivered to my door this morning, and Sarah immediately gave him her seal of approval! I’m told he is great with kids and dogs… that’s obvious, but he’s also good with cats! Wow! This boy is all puppy! He’s at the vet now, and going to have the full treatment today! More news tomorrow! 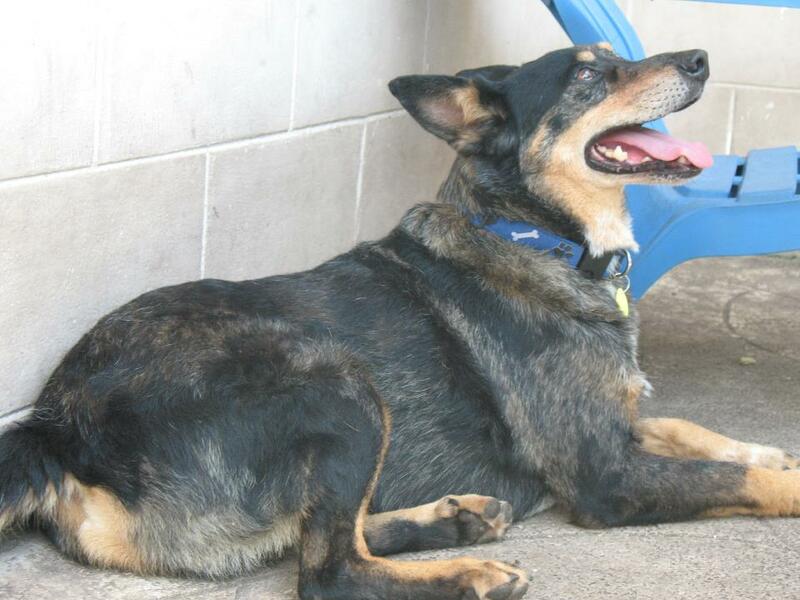 History: His name was Duke, and when we saw him, and we were ready to take him, but he had been adopted. I have named him Rammstein. He was originally found on the streets of Miami by a woman who kept threatening to take him to the shelter because she didn’t have space for him. He went to two homes. The first home in Miami not keep him because he exceeded the weight limit for their condo association. 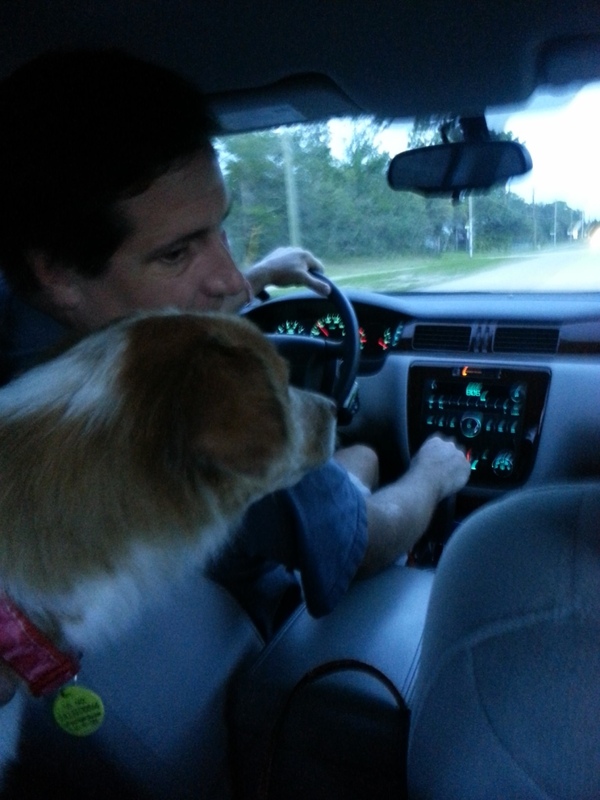 A volunteer named Mi picked him up from Miami and drove him to Tampa where a second home was ready for him. However, the second home didn’t work out allegedly because of his high energy. 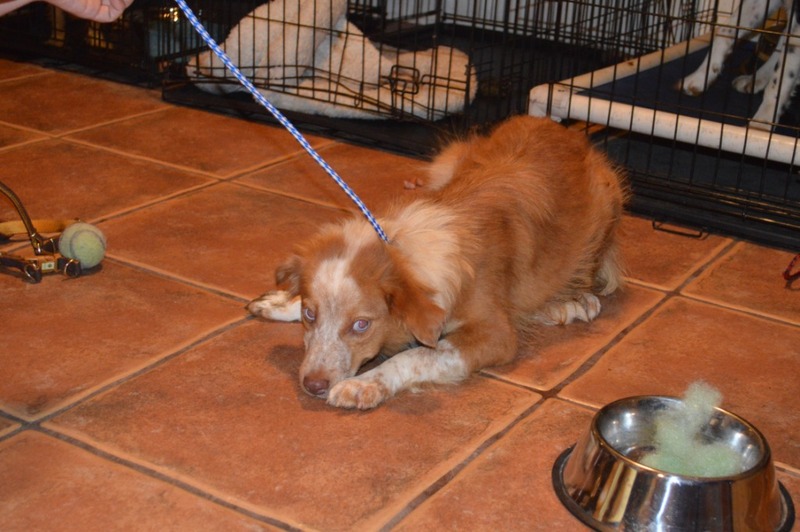 Mi is committed to find this boy a good home, she is transporting him to me tomorrow! 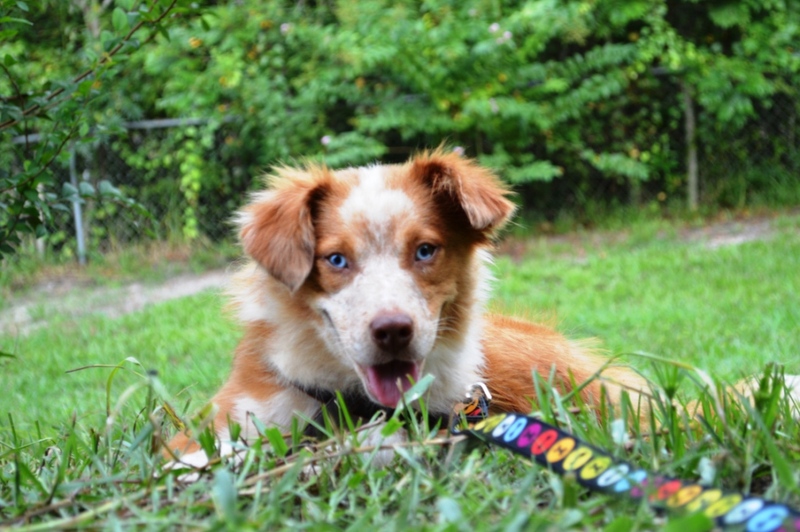 We will be evaluating his medical condition, having him checked out by our vet, and evaluating his temperament… I have a feeling this boy will fit right in at our Border Collie Boot Camp, and we’re going to have a lot of fun! I wonder which one of my pack he’ll choose to be his new friend? 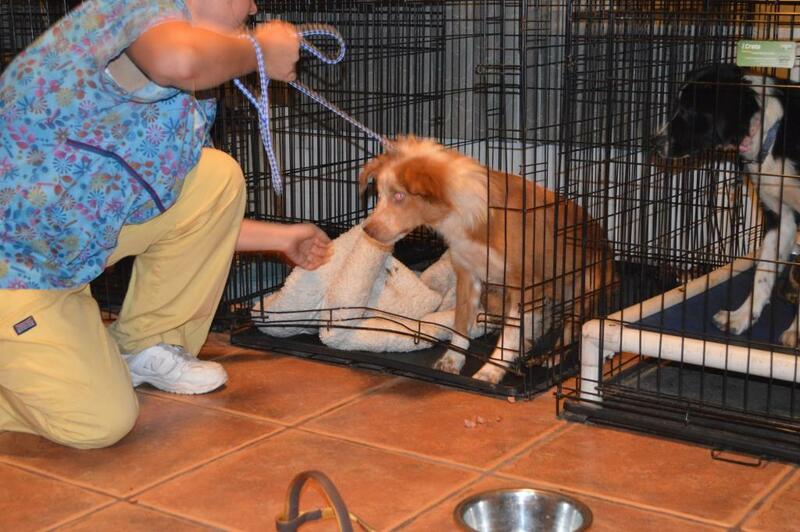 Special thanks to Mary Lou, his rescuer and transporter! 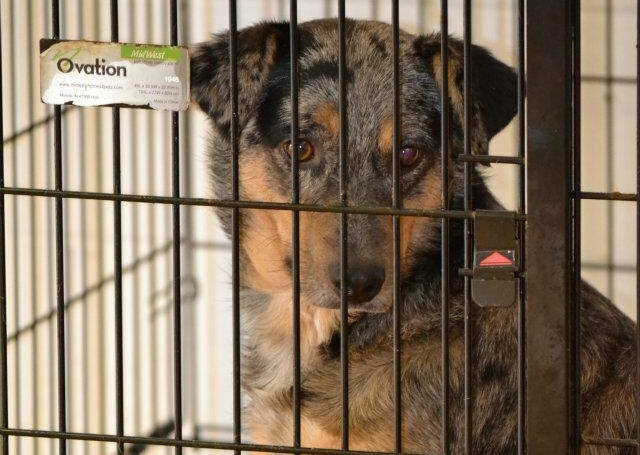 Brody is a soft coated Cattle Dog/Aussie mix that came to us in May 2011 needing to regain his puppy confidence. He was happy, but often appeared blue and was overly submissive. Through constant obedience training and lots of love, he has transformed over the last year and a half- overcoming severe separation anxiety- into a confident, cheery young pup. 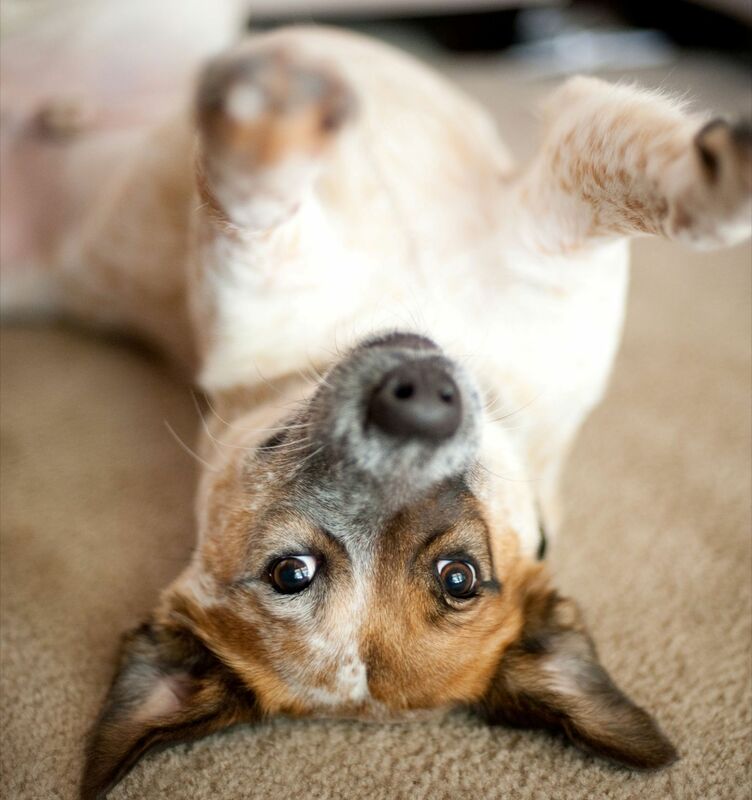 Unlike a regular Cattle Dog, Brody is content to spend lots of time indoors with his people, staying close to keep them company. He will run, on occasion, in full herding mode, but it’s short lived and he’s ready to come back inside and lounge around. Perhaps he just loves the A/C! A perfect companion, Brody loves long car rides, doesn’t pull when walked on a leash, and has learned important commands such as sit, wait, park it, roll over, shake, and spin in a circle. 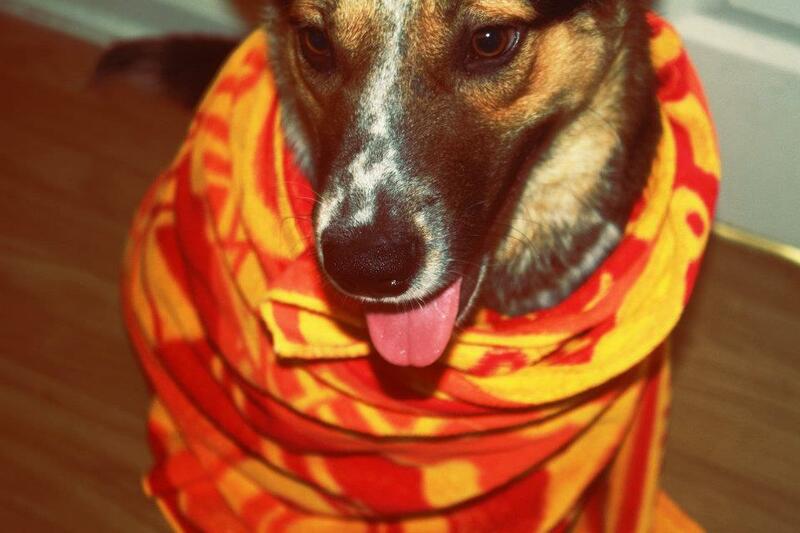 Cattle dogs just love to learn and never forget a thing! Brody is fully house trained, never has an accident, and has been crate trained, but is not crated because he is so well behaved when left alone for a full work day. He does need to see outside – a low window or French door- so he can watch for his people and loves to have the radio on during the day. Just don’t leave pillows out- they are a tasty snack for him! Brody is very social with guests- cautious at first, but warms up after a few treats and some back scratches. 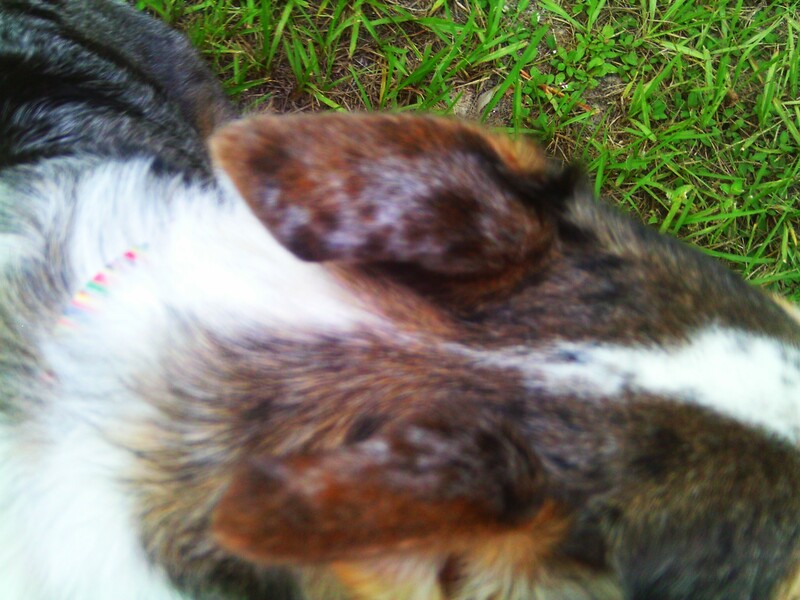 He can be counted on to bark when hearing strange noises, alerting us to unknown visitors. Brody does like older children, but gets nervous around younger children- his ideal home is with children approximately age 10 and over, as we have seen him play with our family members this age on several occasions and he can’t get enough of their appetite for play time! Brody loves other animals- both cats and dogs and would love a house that has either or both. 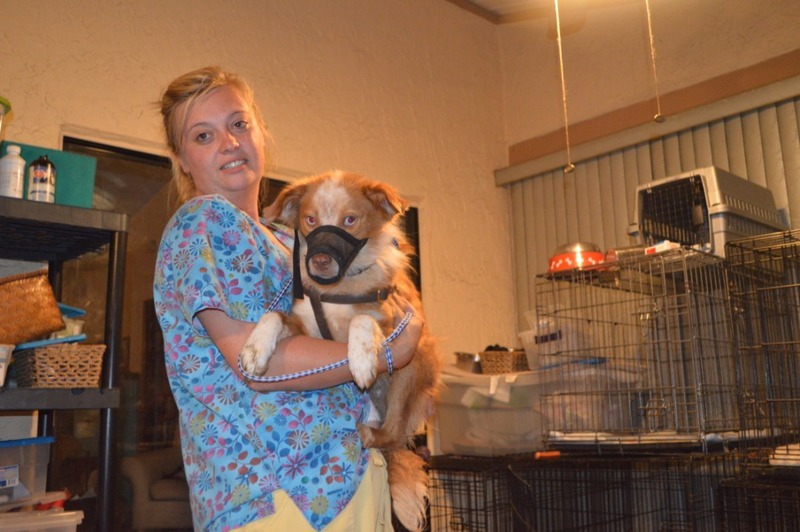 He is able to play well with our cats and dogs ranging from Labs to Chihuahuas. You can see more photos of Brody on Facebook. 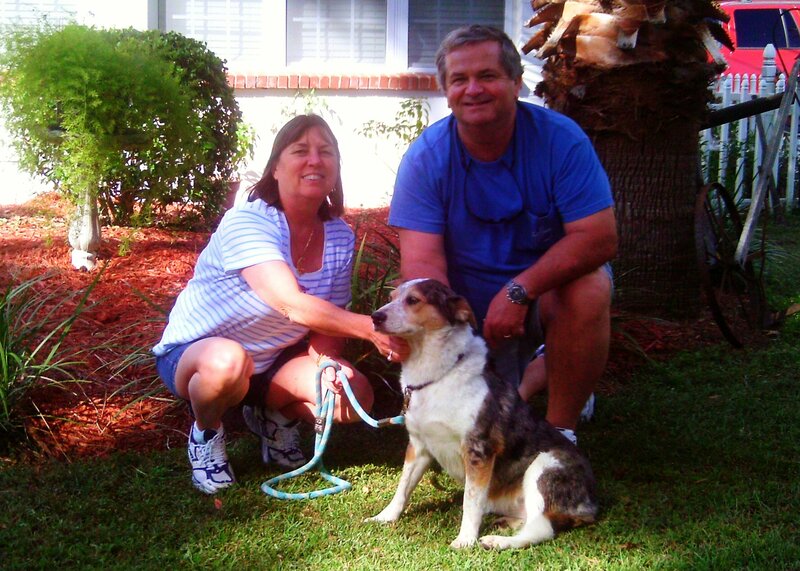 Brody is being fostered in Jacksonville, Florida. If you are interested in meeting one of our dogs or learning more about it, please e-mail us at TheDogLiberator@gmail.com and let’s get the process going! 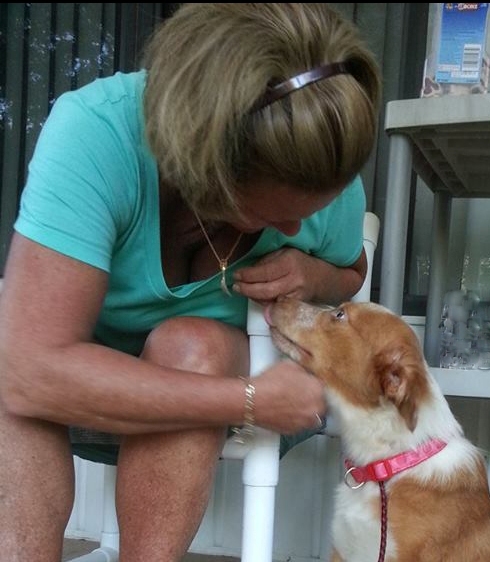 Update: Brody was adopted by Tracee Perrotti. His updates are great, he’s just a dream dog! A unique name for a unique girl! 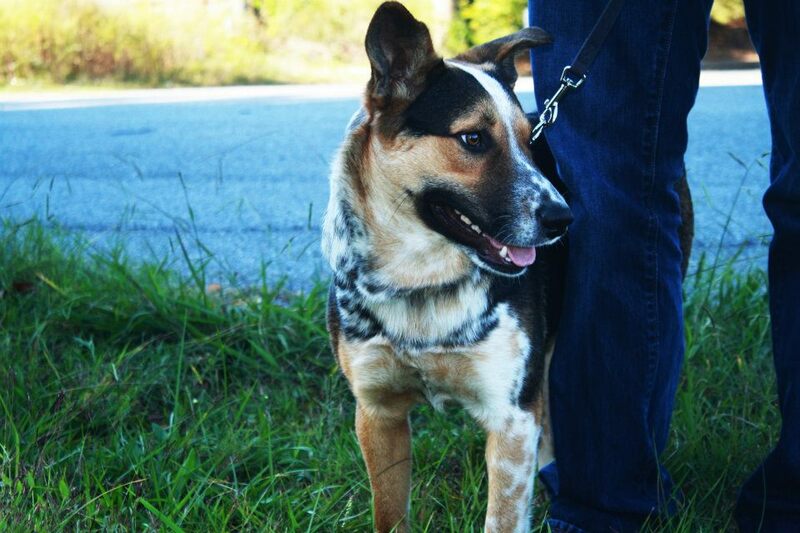 Tiger Lily is a 3-year-old Australian Cattle Dog/Australian Shepherd girl that comes to us from Athens Dog Pound in Athens, AL, thanks to the help of Dale Parrent, Deb and Tom Gaylord, and numerous other shelter volunteers and supporters. Tiger Lily’s owner was unable to keep her and surrendered her to animal services, along with four other dogs that are now in foster care with TDL: Jacqueline, Shepherd’s Pie, Footloose, and Fancy Free. We don’t know why Tiger Lily and her pals were given up, but it’s obvious they were cared for as they are in good weight, well-adjusted, and heartworm negative. Of the three dogs we pulled on this rescue run, I think the extended time at the shelter affected Tiger Lily the most. For the first two days, she seemed to be in shock and pretty much shut down (only picking at her food, panicking when I got out of her sight, waiting by the back door for me to let her in, ignoring the other dogs when they played). 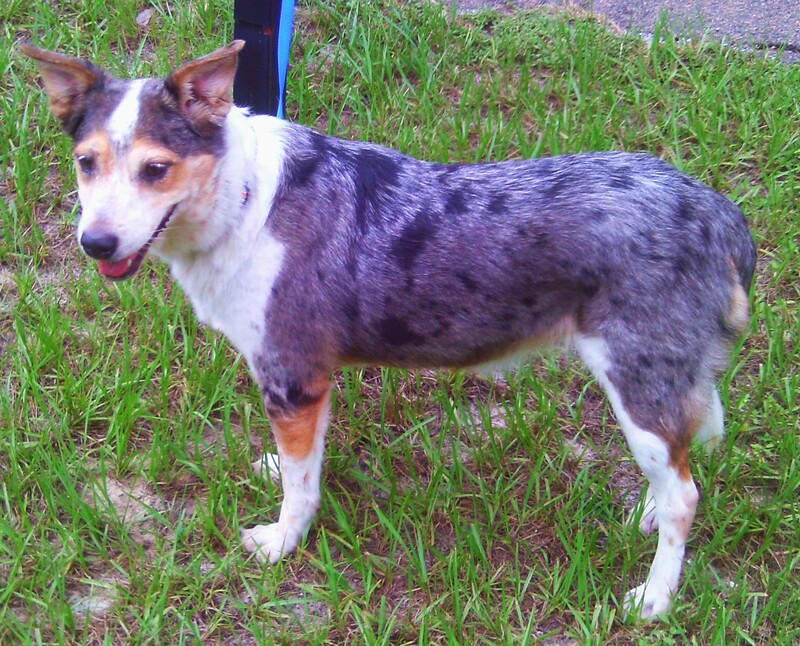 I decided to wait another day or two before I made any judgements as to her personality; this behavior isn’t unusual in dogs coming from a shelter environment and cattle dogs can be more intense than many other breeds. Boy, am I glad I waited to write this foster diary — this morning Tiger Lily found her puppy joy again! She ran and played and roughhoused with the other dogs for over an hour. They were moving so fast, try as I might I couldn’t even catch them on film. I’ve never seen so many play bows at one time. Oh, happy day — I just love watching a timid dog break out of her shell! 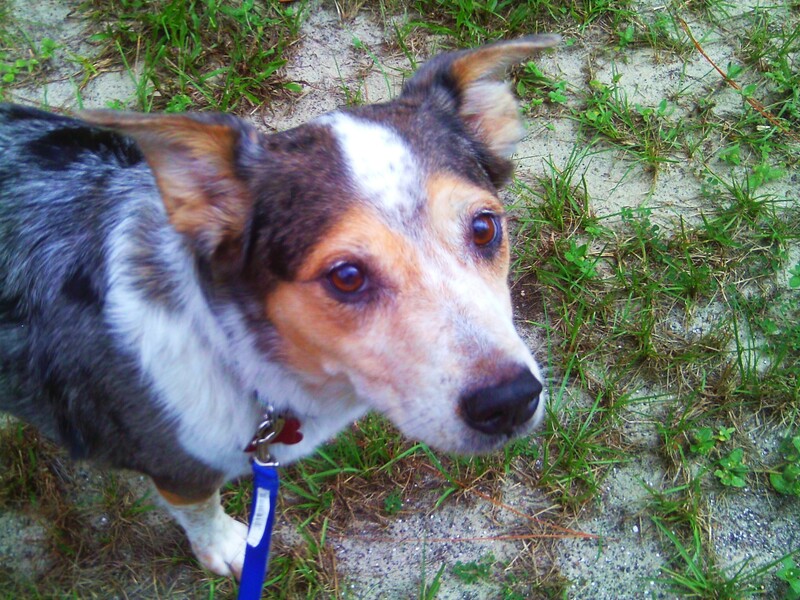 Tiger Lily is leash, crate, and housetrained, and enjoys riding in the car. Obviously, she gets along well with other dogs (I have six at my home right now, four fosters plus my own two dogs). 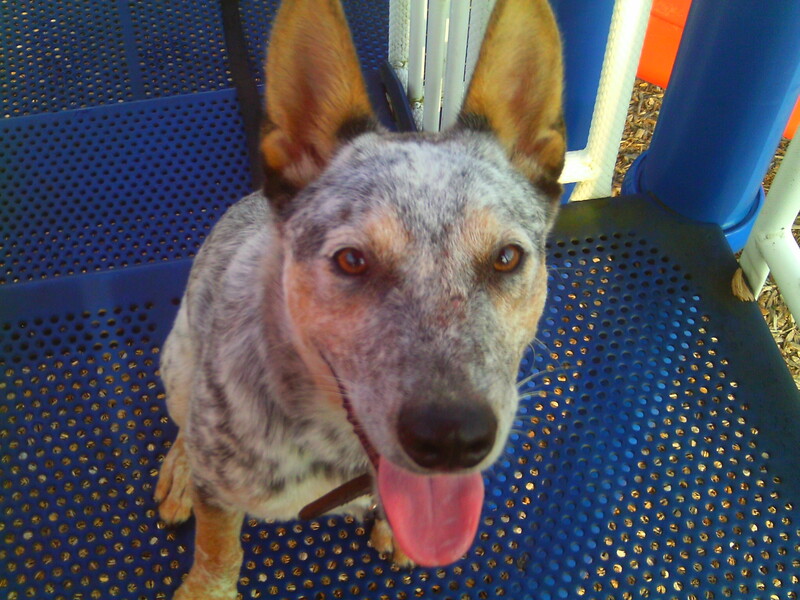 She is loving and attentive, very focused on her person/people, which is what you’d expect from a cattle dog. A good size, she weighs in at 38 lbs. You can view additional photos on her Facebook photo album. If you think you may be interested in adopting Tiger Lily, please review our adoption process and e-mail me at gisele.thedogliberator@gmail.com. Dec. 4, 2011 Foster Update: Any trace of shyness that was left in Tiger Lily is completely gone now! She’s quite the friendly little attention hound now. She’s the first to greet strangers and demands that they pay attention to her. Doesn’t matter if you want to scratch her ears or rub her belly, you just better be ready to do some lovin’ on this dog. 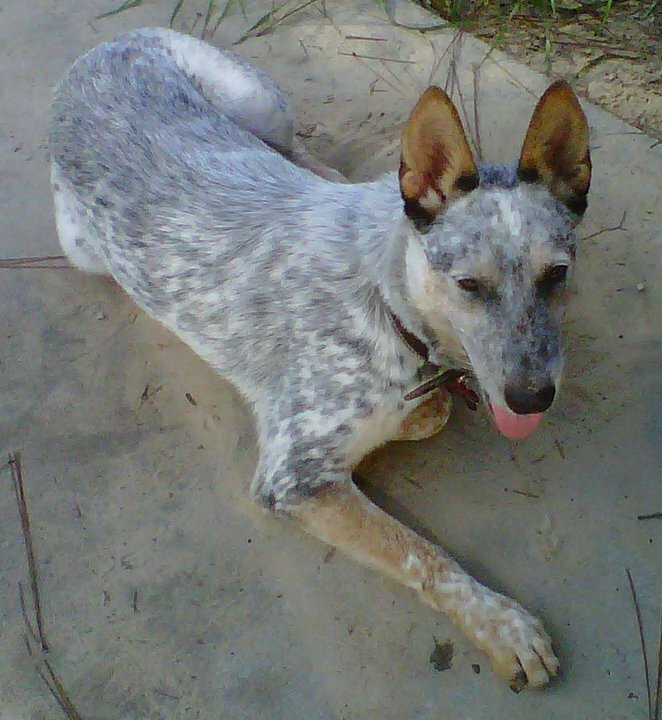 The Cattle Dog is really starting to come out in her, too; when the pack is running and playing, Tiger Lily’s running and playing … and trying to heel them all! It’s quite comical to watch, really. I keep trying to get it on video, but these dogs move too fast for my camera! Here’s a holiday video I did today with all of my fosters, including Tiger Lily. Check it out! Dec. 8, 2011 Foster Update: For some reason, I had a difficult time choosing a song for Tiger Lily’s video. I couldn’t make a decision between this song and one other tune. Well, Tiger Lily chose for me: I was replaying this song for the umpteenth time when she threw her head back and howled. I took it as a sign of approval! Enjoy! 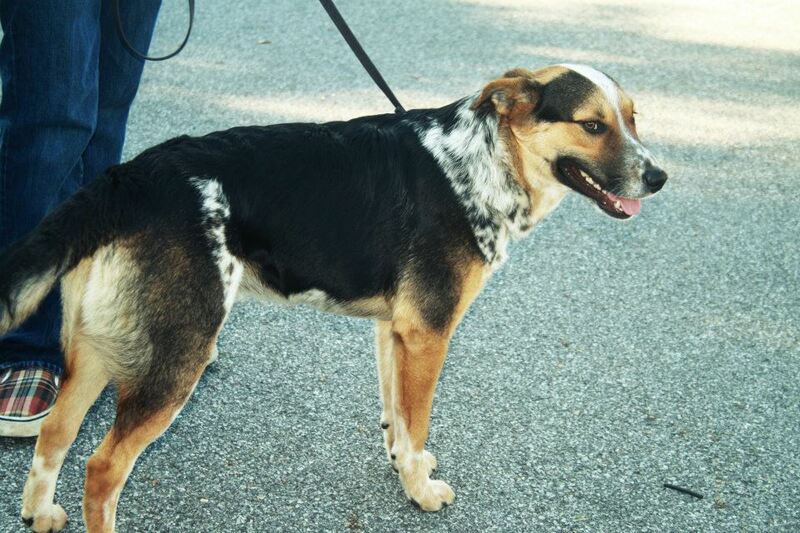 Gordon County Animal Control has brought us yet another stunning dog! 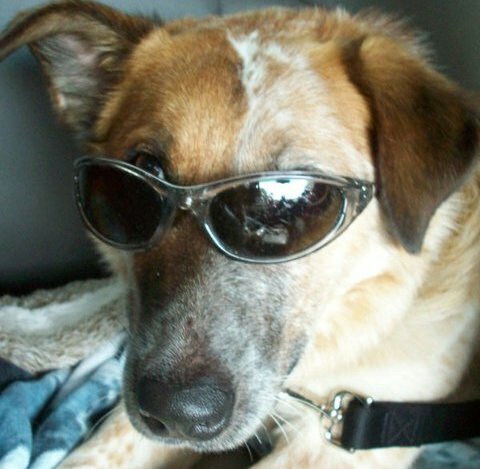 TDL friends and family, I’m pleased to introduce to you Apache Sky– Georgia’s most eligible ACD bachelor! Forget “diamond in the rough”, this guy is the real deal. No polish necessary! 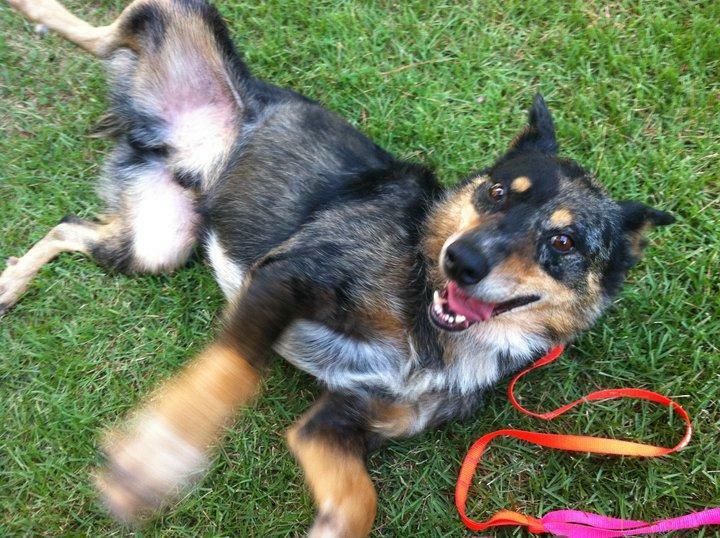 Apache Sky is housebroken, great with other dogs, cats, and children, and has a superb recall. Already responding to his name, Apache is rapidly catching on to his basic obedience commands, as well as his crate-training (though admittedly, he’d rather be beside you on the couch)! It’s very apparent Apache desires nothing more than to be praised. He will do anything for your approval, and goes giddy as a little pup for bellyrubs! He is so well-adjusted, he will make a wonderful addition to any lifestyle. I envision Apache trotting happily alongside his humans on a hike, or tagging along on a group trail ride. 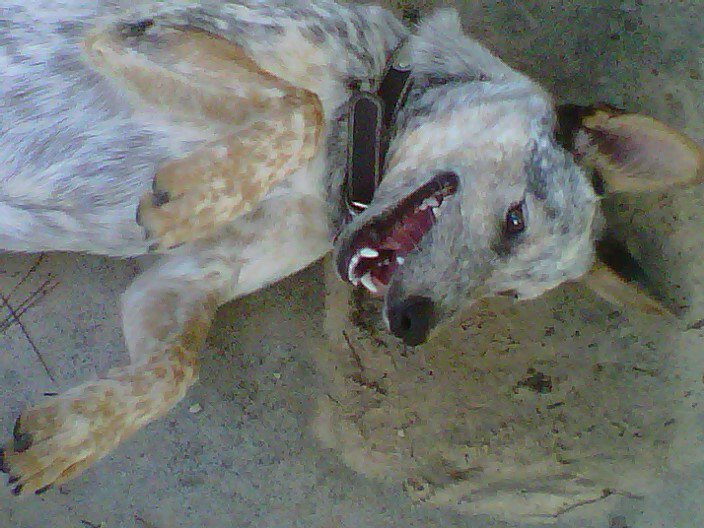 Uncharacteristic of your average ACD, Apache has no ball drive, but that doesn’t mean he doesn’t like to play! 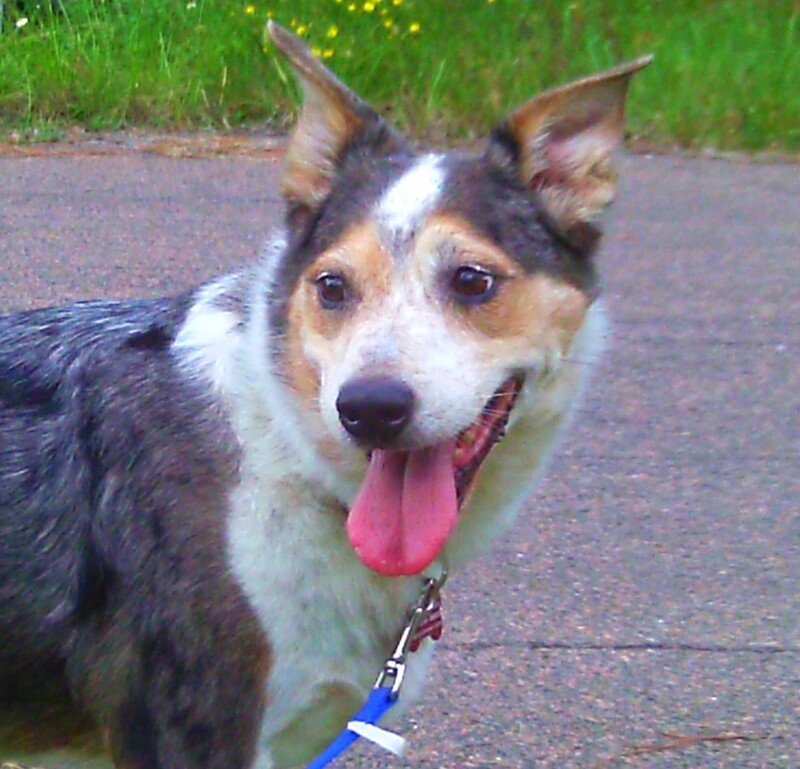 He’d make a great “first dog” for anyone interested in dipping their toes into the pool of herding breeds, as he is high-energy, but very manageable. My only concern is that he may be a little too rough for the tiny tots–he can be boisterous when showing his affection, and might accidentally knock a little one over. …Of course, he’d make up for it by slathering them in kisses! Truly, I can’t say enough things about this remarkable boy. And if my babbling about how sweet he is isn’t enough–just look at him! 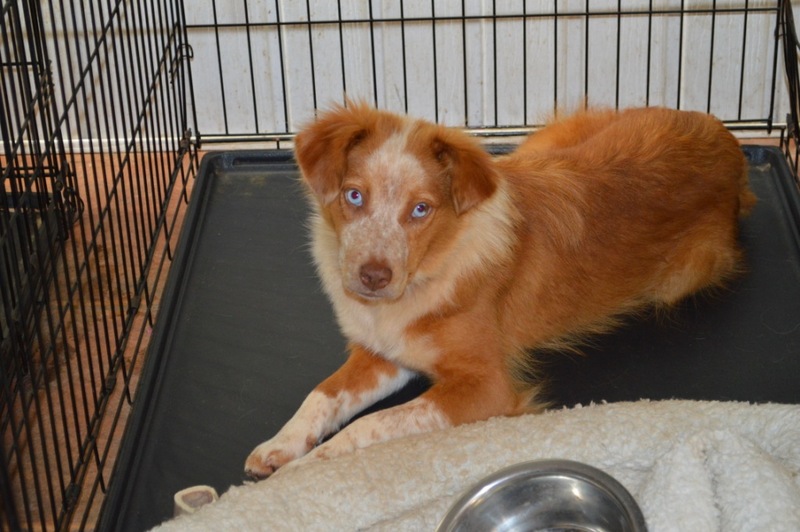 This is a beautiful boy with a beautiful personality, who is looking for his perfect family. 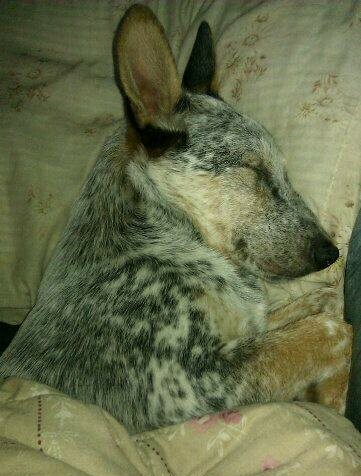 You guys won’t believe it, but Apache has finally learned what it means to be a Cattle dog! 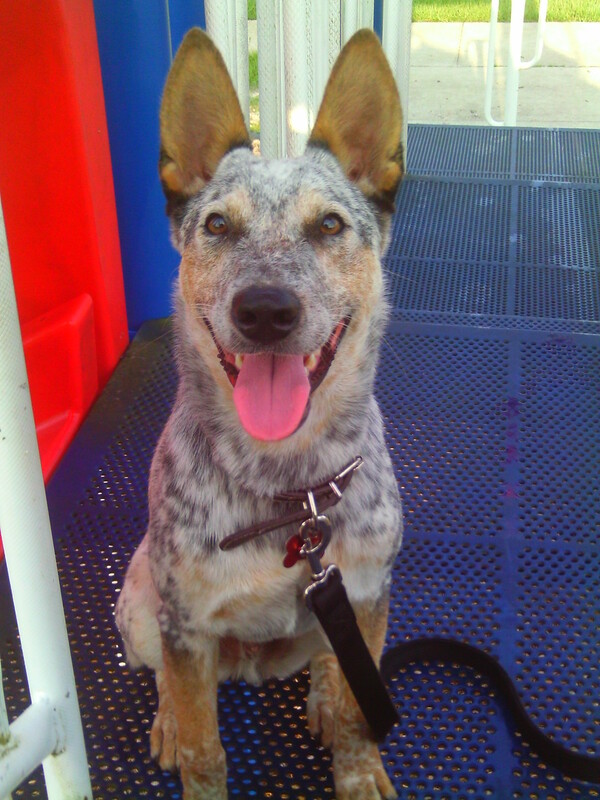 And by that, I mean he has finally discovered an ACD’s one true joy– the ball! Playing ball for the first time! Personally, I can’t even convey how elated I am about this news. I can’t count how many times I’ve thrown the ball thinking to myself “Maybe today. Maybe, he’ll play today!”. Well, I can proudly say, that day has finally come. Apache has found his drive! It was like turning on a light switch–one day he looks at me like I’m crazy for constantly throwing the ball into dead air, and then the next, he’s tearing up the dog park after every throw I toss! Scoping out the new surroundings! Apache is really coming in to his own! Now that he has settled down, he is showing his true colors as a total ham. Belly rubs are still his favorite guilty pleasure, but he’s recently discovered the joy of running, And boy can he fly! 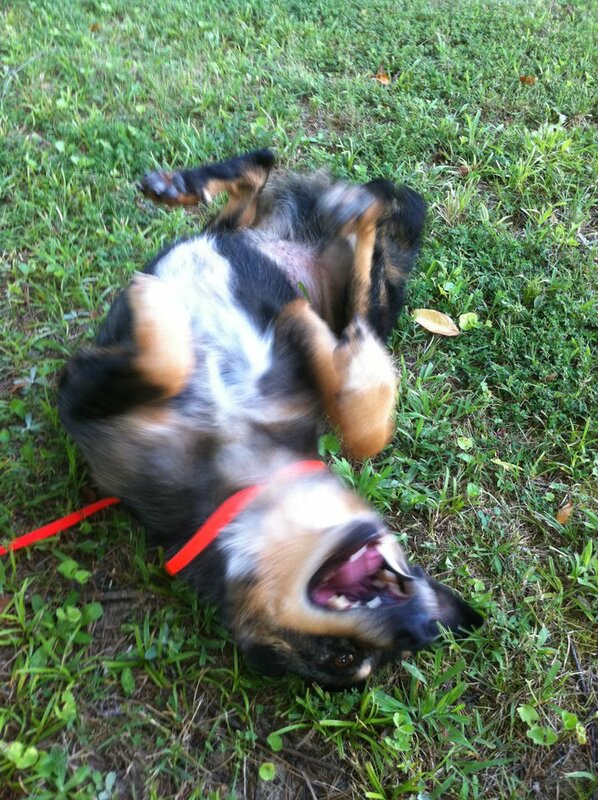 Though still not terribly interested in balls, Apache is all about playtime! 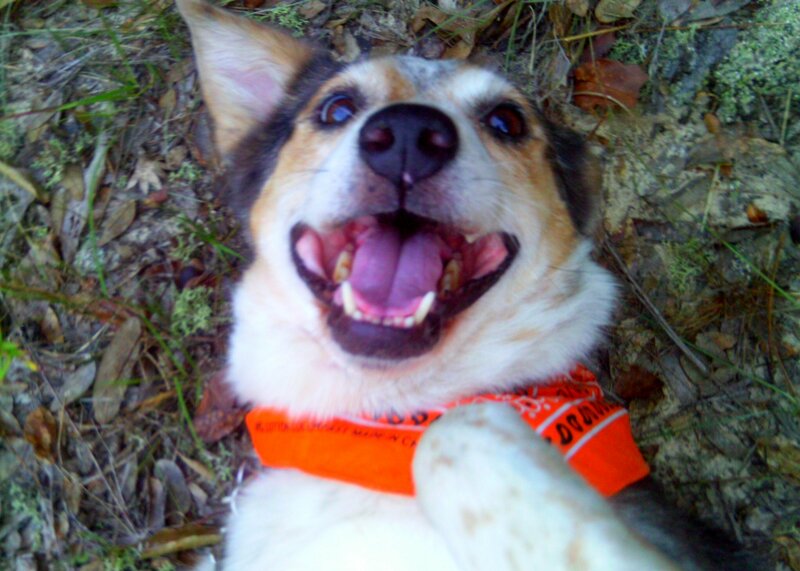 Apache is the expression of pure joy when he is out frolicking with his dog buddies. This is a dog that will play until he drops–if he drops, that is. But unlike other heavy playtimers, Apache takes less of a “rough and tumble” approach to play. He is non-vocal and not very mouthy–there’s no bossy bone in this boy’s body! It’s this attitude that makes him a great “dog intermediary”. Even grumpy puppies like my Weezer love him! I bring him to work with me everyday so that he can get ample socialization and playtime, and let me tell you–I don’t think there is a single dog in the world that Apache wouldn’t like. Dog and person alike are greeted with the same friendly fervor. Each new meeting is like an opportunity to make a new best friend! Apache has also grown to LOVE car rides since he has been coming to work! What used to take a lot of coaxing now takes a simple “okay!” before he hops right in to the back of the car. He knows he is going to see all of his friends, and you can see him literally wriggle with excitement! His understanding of his basic commands is getting stronger every day, and he is very proud of his sit! He’ll sit for everything; attention, food, praise, toys…he’ll even sit for a stranger, and sometimes other dogs. Fresh out of the bath, and smiling! To be frank, I’m shocked this boy hasn’t found his forever home yet. He is such a wonderful dog, with such a HUGE heart–my neighbor’s children adore him. Heck, I adore him! He is so willing to please, everyone who meets him falls in love. Truly he’s a gentleman of the dog kingdom. Ladies, your perfect “nice guy” awaits! 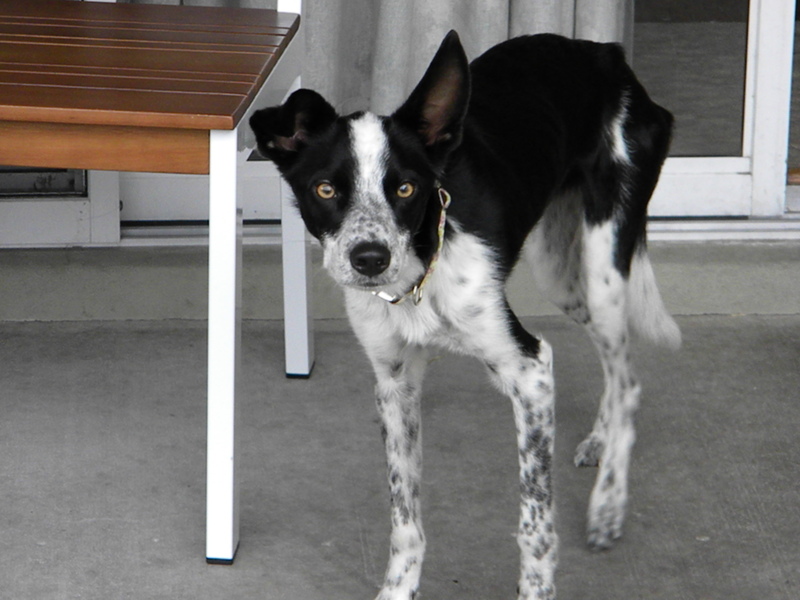 A little over two weeks ago I was scheduled to foster a Border Collie boy named Memphis. 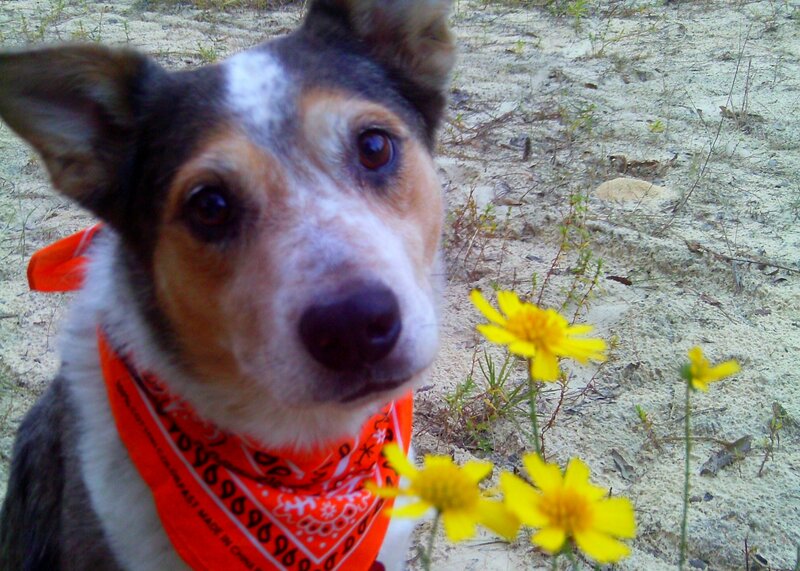 Simultaneously, the ever-lovely Amy Benz sent out a photo of a stunning cattle dog available in Gordon County. Just like I tell my friends and family when they ask how I know which dogs to pick; “When you know, you know”. I saw his photo and I knew. I had to have that dog. I spent the next few nights really sulking. I had already committed to Memphis, but I really wanted this boy. I had to have him. I shared him out all over the place; my heart wouldn’t rest. All the while, a shelter volunteer kept telling me what a great little dog he was. I had forced myself to accept that fact that fostering a second dog in my apartment was just impossible. Quickly some calls were made to our transport-extraordinaire Kathy Keith, and we arranged for her to pick up the happy little cattle dog who had been plaguing my dreams. Now, two weeks later, Apache (formerly dog #749) is relaxing calmly in his crate, after just getting back from the vet with a clean bill of health. 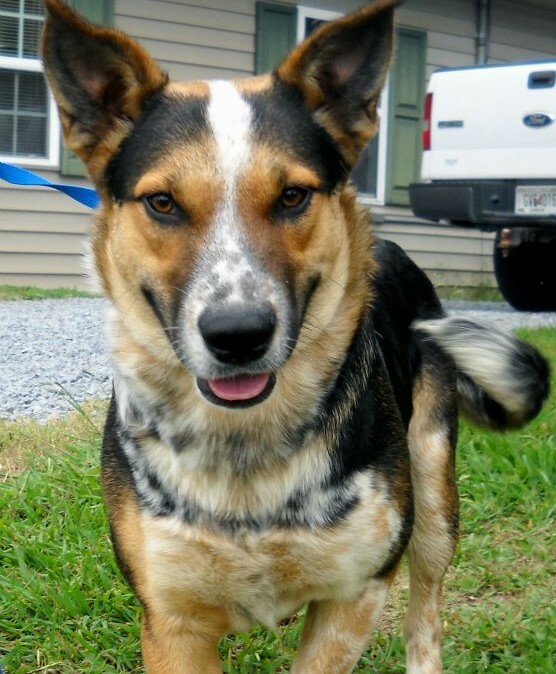 Fully vaccinated, heartworm negative, and neutered, Apache is 100% ready for his new home. In fact, he was ready the second he got out of the shelter! Already, he is well-loved by all who meet him. Even the vet techs were enamored by him; one even remarked on his outstanding attitude, despite just being woken up from surgery. “He was ready to play, right when he woke up!” she had said. Unfortunately for Apache, playtime will have to wait for today, as he must don “the space helmet” until his stitches have healed enough. But even that doesn’t get him down–he’s just happy to be around us, and be showered with affection. More photos of this stunning boy can be found in his facebook photo album here. Currently being fostered by Khaz in Atlanta, GA, if you would like to know more about Apache, please direct all inquiries to Khaz.thedogliberator@gmail.com! Earl Grey Goes Home… really really fast! He came off transport on November 5th (at our reunion) at approximately 5:30 PM and was adopted about an hour later! 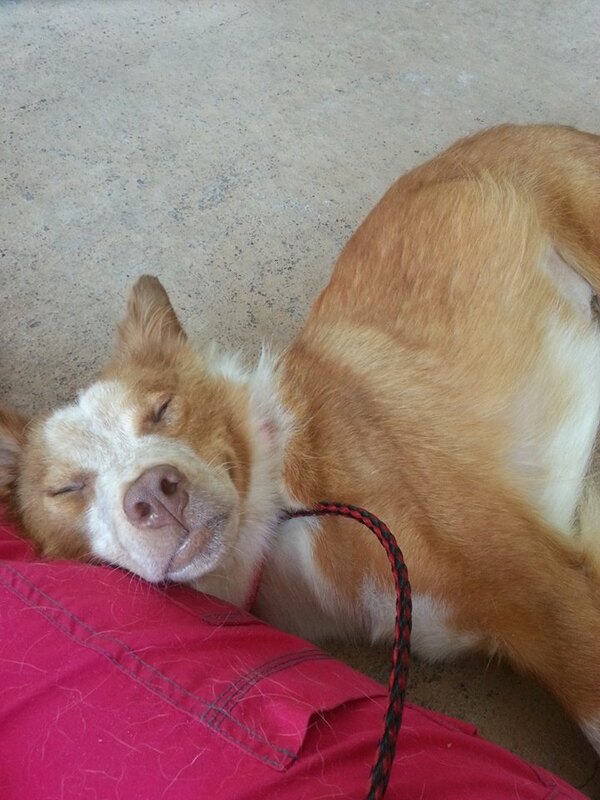 Fostered by Deb Gaylord, this young man was easy peasy! 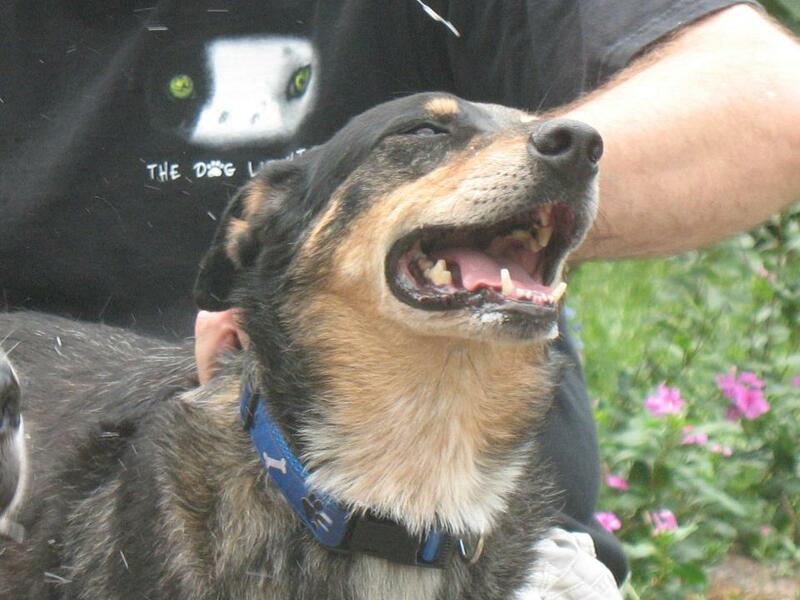 Even off of transport, he was affectionate, a great listener, easy to please, and gorgeous. Hillary wins the prize! 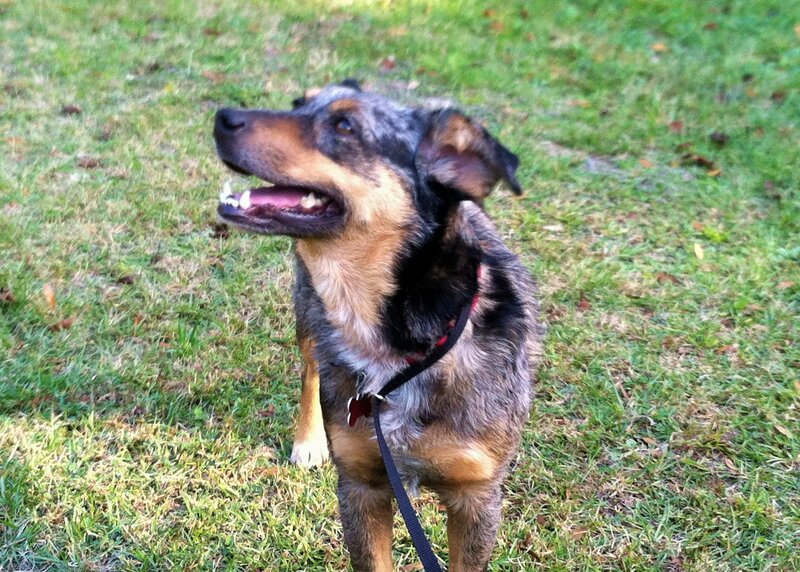 Gainesville, welcome your latest TDL Dog! Are we at Amy's house yet? 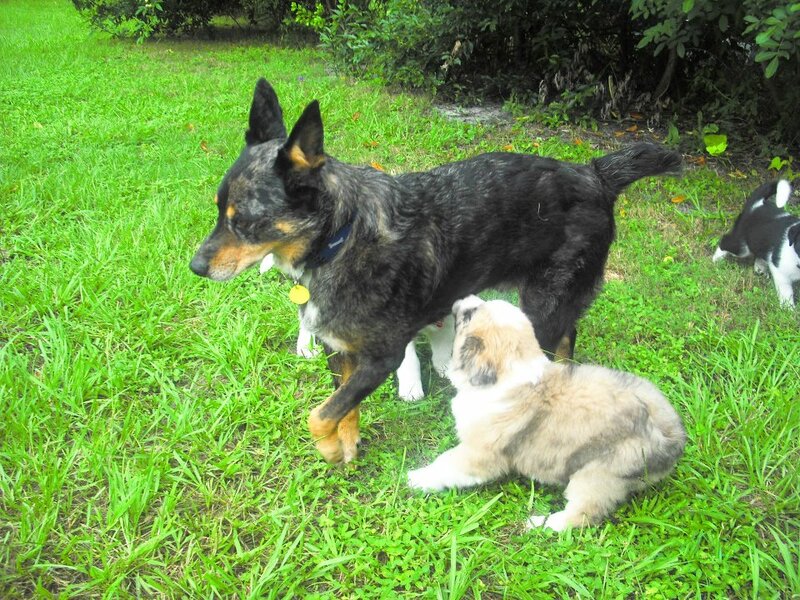 Nadia Caron-Davis, a wonderful volunteer for Friends of Citrus County Animal Services (FOCCAS), e-mails me whenever herding dogs come into my local shelter. 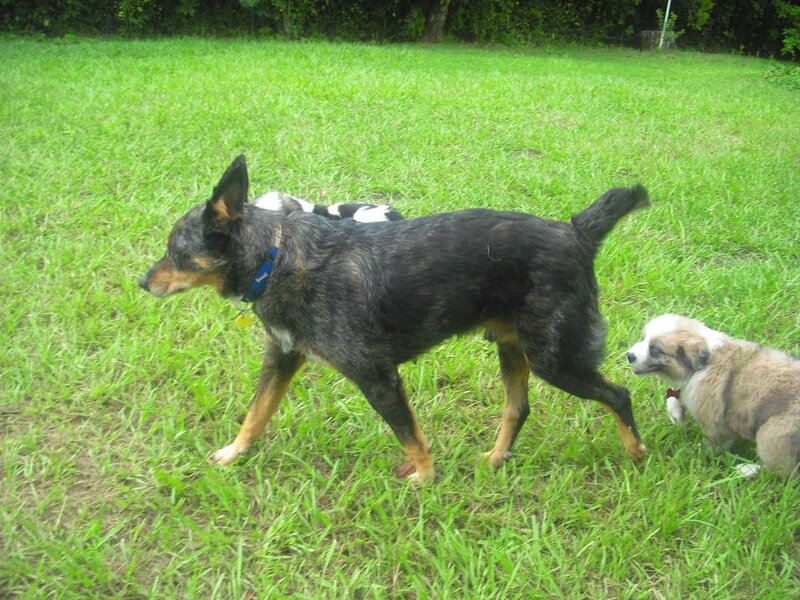 She’d attached photos to her most recent e-mail showing three female Australian Cattle Dogs, one of which was 10+ lbs. overweight, and one very sick looking female border collie. Apparently all four dogs had come from the same source. I had two foster dogs at the time, so I replied that I could take one, pending temperament testing. Nadia responded that wasn’t a problem … she’d let me know in a few days. Several days later, Nadia e-mailed the information I’d requested. Some good news, a lot of not-so-good news. 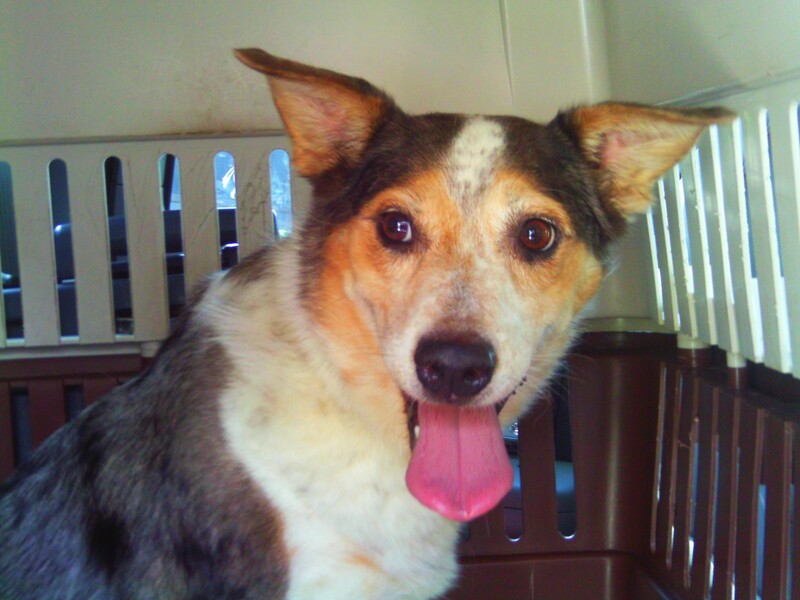 The good news was that all the ACDs were friendly toward people and other dogs and ignored cats. It appeared they were littermates and approximately five years old. Unfortunately, two of the girls had some hair loss due to flea and/or food allergies and were heartworm positive. The unusual-looking blue merle girl with red points and white eyelashes miraculously had no allergies and was heartworm negative. However, she was the shyest of the three. All of the dogs had worn or missing teeth, most likely from chewing on chains they’d been tied with or on the doors or sides of an outdoor kennel. 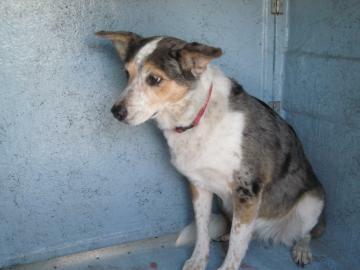 The female border collie, also around five years old, had significant medical issues and most likely would’ve been put down if a good Samaritan hadn’t come along and adopted her in the hopes of providing as much comfort and love possible for the time she had left. Several hours and three dogs later, I had my decision. Actually, as so often happens, the dogs made the decision for me. Although her sisters were friendlier initially, the little blue merle girl with the white eyelashes captured my heart. It took her 10 minutes or so to warm up to me, but when she did, she sat down next to me and put her paw on my leg so I would pet her. If I stopped petting her, she’d put it there again. That was my sign: She’s the one! 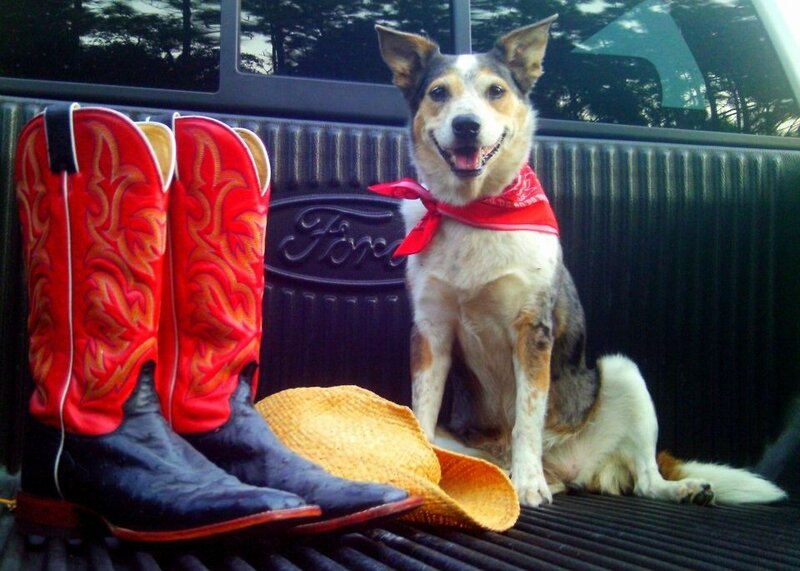 Arrangements were made for Nadia to transport my girl, who I’d named “Cowgirl,” to me the following week. 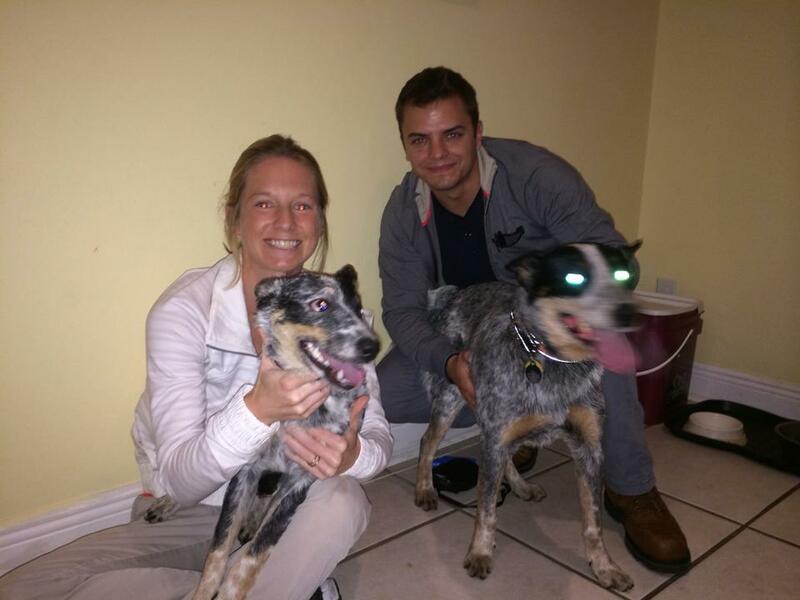 In the meantime, one of Cowgirl’s littermates was adopted! Wonderful news! So here I sit, Cowgirl by my side. So far, she’s been a perfect lady — quiet and demure. I’m waiting for the rough and tumble Cattle Dog to come out! lol Until then, I’ll let Cowgirl show me exactly who she is. What I do know is that she’s approximately five years old, weighs 35 lbs., and is spayed and fully vetted. Cowgirl rides well in the car and didn’t bat a single white eyelash when I introduced her to my crew. She walks in the heel position on the leash and has excellent off-leash recall. Oh, and did I mention that she’s housetrained? 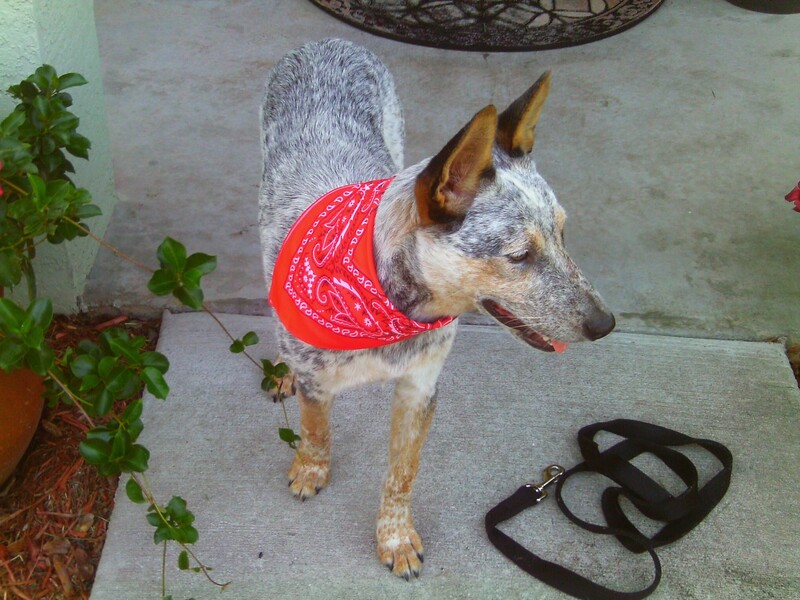 Cowgirl is being fostered at my home in the Ocala area. You can view her photo album on Facebook. 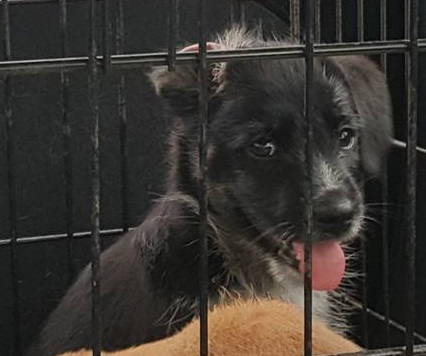 If you are interested in adopting her, please review “How to Adopt From Us” and email your information to me at amyb.thedogliberator@gmail.com. 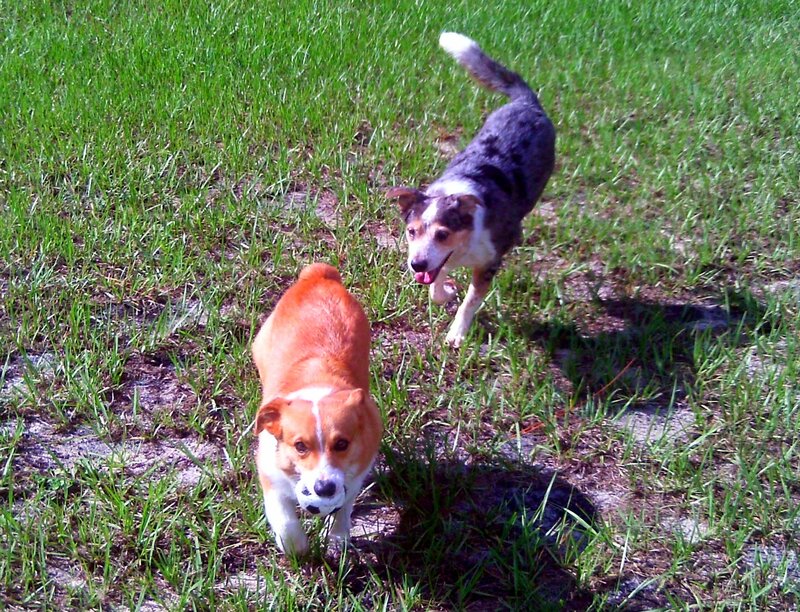 Cowgirl likes to herd corgis! 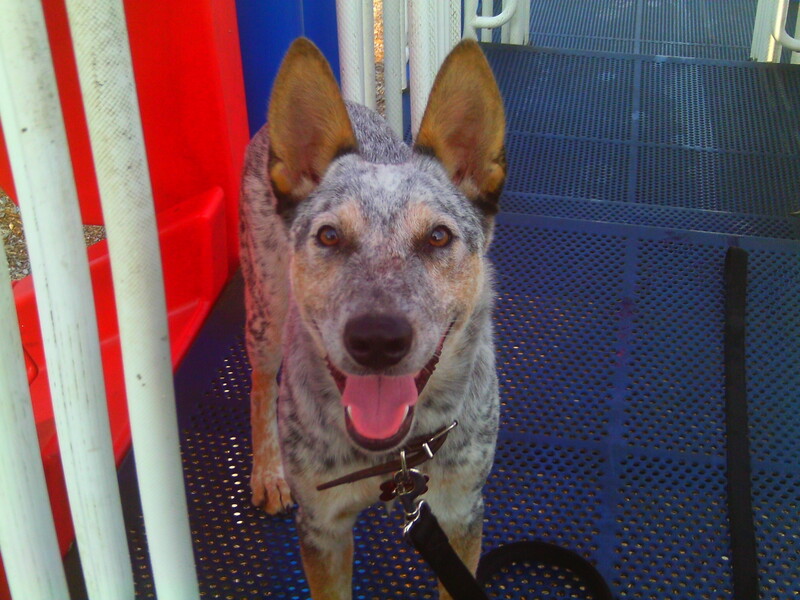 Sept. 26, 2011: Today I took Cowgirl to see Dr. Bailey for a check up and a second heartworm test. As I wrote earlier, the other three dogs that accompanied Cowgirl to Animal Services were heartworm positive; I just couldn’t believe that she wasn’t heartworm positive as well. Unfortunately, the second test proved me right (I’d much rather be wrong!). Dr. Bailey also confirmed that Cowgirl is around five years old. She said all things considered Cowgirl’s heart and lungs sound good and her teeth look pretty good as well. Hey, some positives — we’ll take it! I’ll be starting Cowgirl on the slow kill heartworm treatment immediately using the supply of Doxycycline and Prednisone I purchased at the vet’s office today. 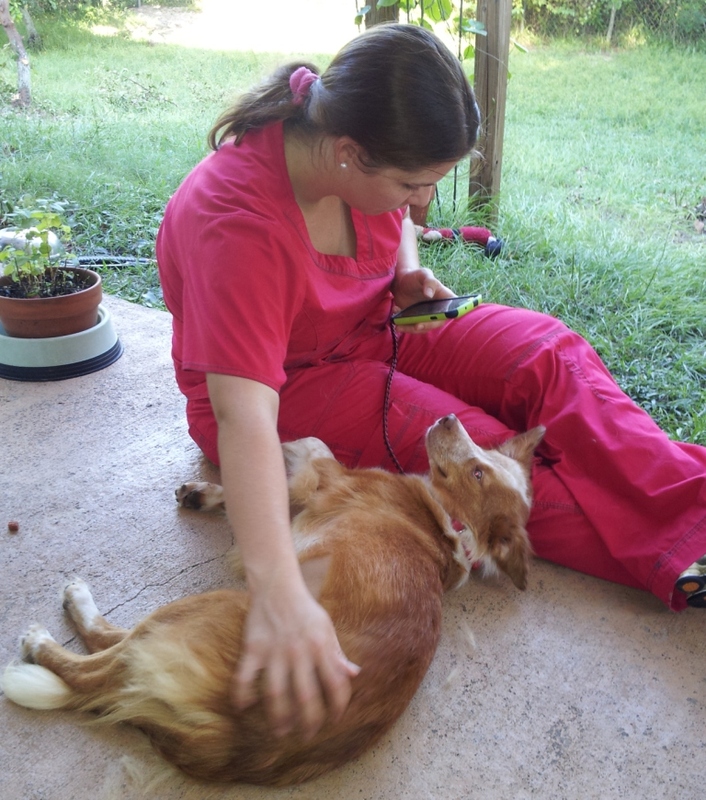 In addition, Cowgirl’s adopter will receive a year’s supply of Heartgard to continue with her treatment. And Cowgirl? Well, she couldn’t be any less concerned about being heartworm positive. In fact, today she decided to try her hand at herding corgis. Get along little dogies/corgis … same difference, right? Sept. 29, 2011: I have to say, I’m just loving this girl! 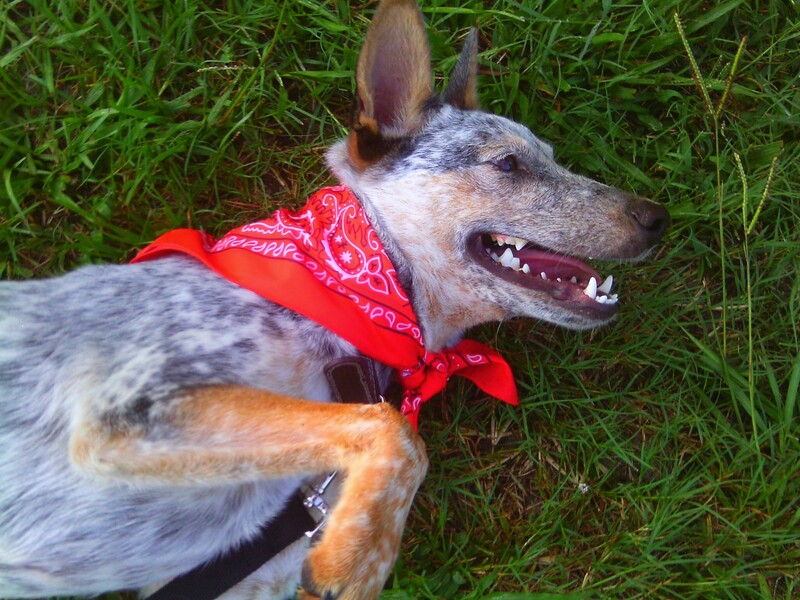 Cowgirl has turned into a real love muffin who loves to be petted and scratched. She’s definitely a velcro dog, following me from room to room and sleeping beside my bed. 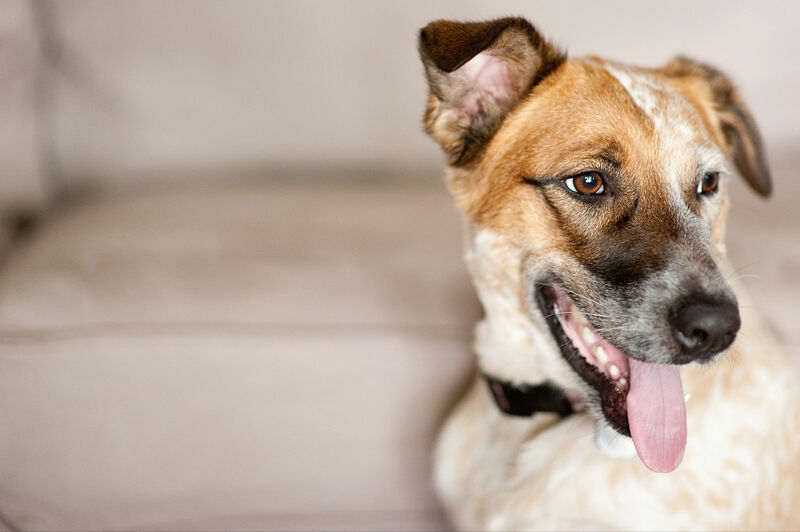 Not one to catch frisbees or retrieve balls, Cowgirl is a companion — a loyal companion — all the way. When we go for walks around the neighborhood, Cowgirl walks right by my side. I leave the leash on — just in case — but her off-leash recall is excellent. 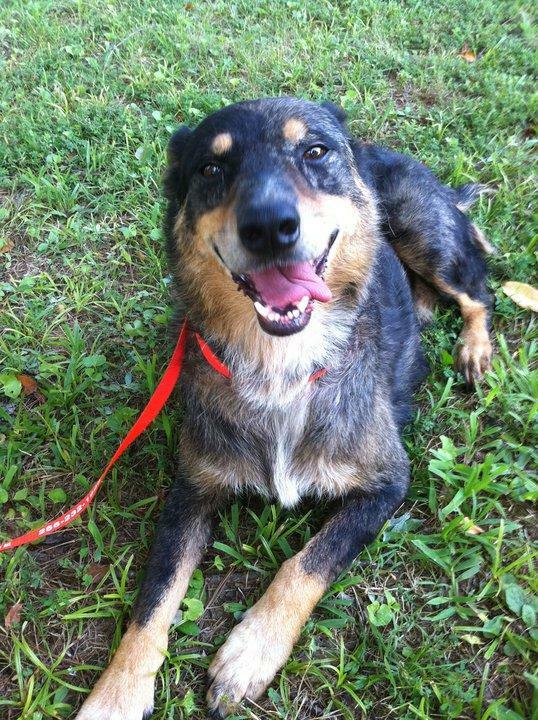 Oct. 3, 2011: This morning, Cowgirl started her slow kill heartworm treatment meds. She’s pretty good at avoiding the pills, but I’ve found a new way to make sure she swallows them, no questions asked. I just wrap them in a slice of deli meat and down the hatch they go! This evening, I took Cowgirl outside just before dusk to take some new photos. Now, I don’t have the best camera (actually, it’s a pretty crappy camera — $59.95 on sale at WalMart), but every once in a while I’m able to capture something special, even if the photo quality isn’t the best. 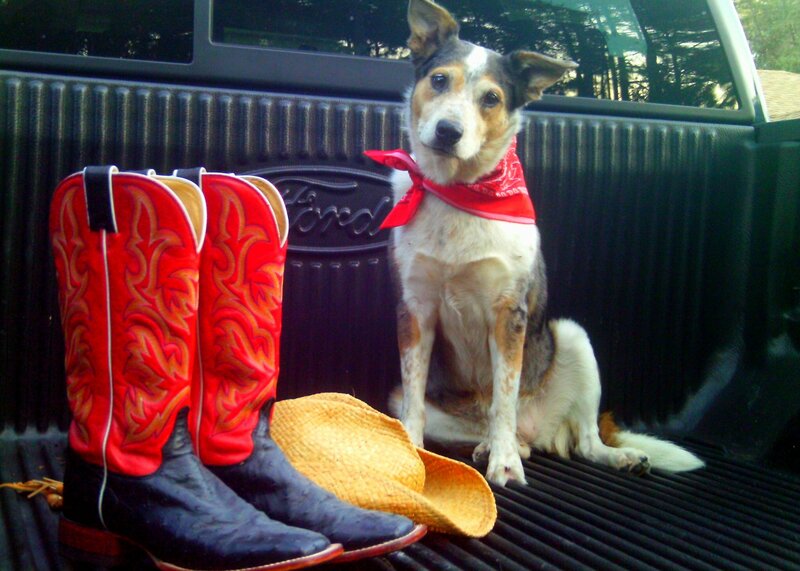 I put Cowgirl in the bed of my truck for a quick photo shoot — she is a “cowgirl” after all! — and she just turned on the charisma, posing, smiling, and even laughing for the camera. It occurred to me as I clicked away that Cowgirl’s demeanor has undergone a fundamental change in the past few days. She’s perkier and smiles more often. Her tail wags more and there’s a lightness to her step that wasn’t there before. But there’s still that soulfulness to her eyes that just gets to me. It’s there in some of tonight’s photos. You can see it if you look. I may be waxing poetic here, but I see loyalty and devotion in those eyes, like she’d follow her person to the ends of the earth. I can’t wait for that person to come along. What a jewel he or she will have! 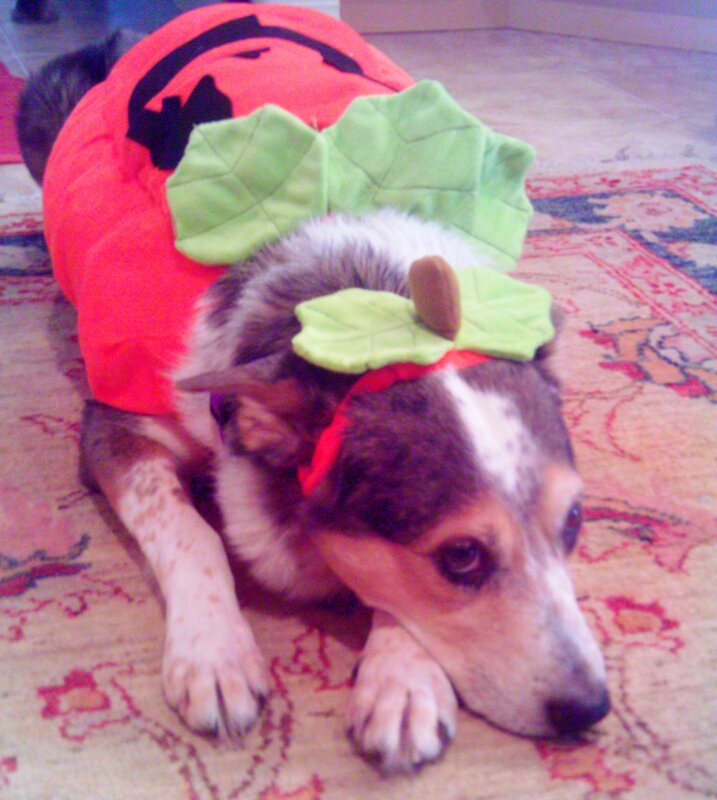 She's super excited about Halloween. 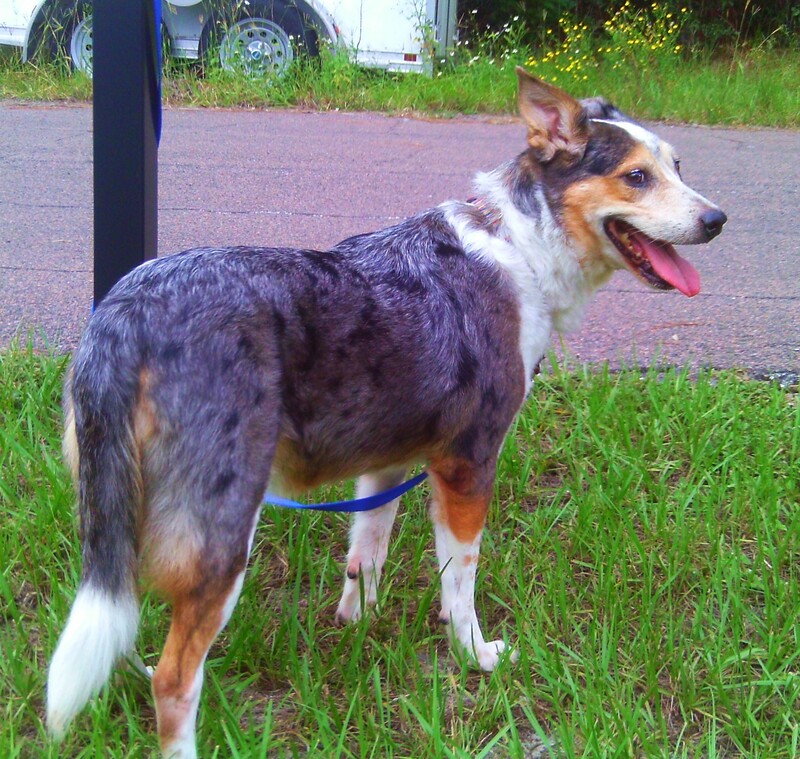 Oct. 20, 2011: I just had to take a moment to say what a joy Cowgirl is and how lucky her people will be when they find her. She is the picture of devotion. And now that it’s cooler and everyone is feeling friskier, she’s getting her puppy playfulness back. I’m fostering a female Corgi, Pumpkin, and I also have a Corgi of my own. Cowgirl has appointed herself “Corgi Wrangler,” and tries to round them up when they start playing a little too boisterously. It’s so comical to watch because she’s constantly looking for their heels to “heel” them. They barely have legs — good luck trying to find their heels while they’re running! I haven’t been able to get it on camera yet, but as soon as I do, I’ll be sure to add the video to this post. Stay tuned … and be prepared to laugh! 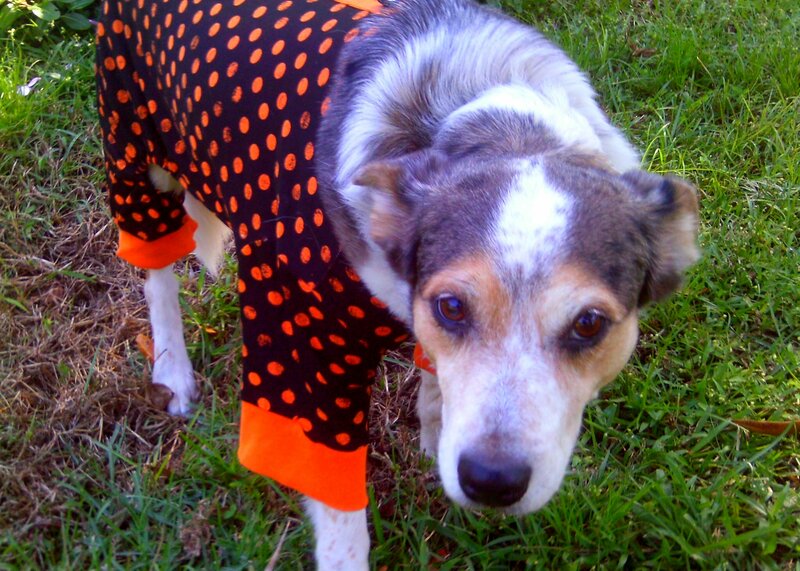 Cowgirl just loves her pumpkin pajamas — NOT! Oct. 30, 2011: ADOPTED! 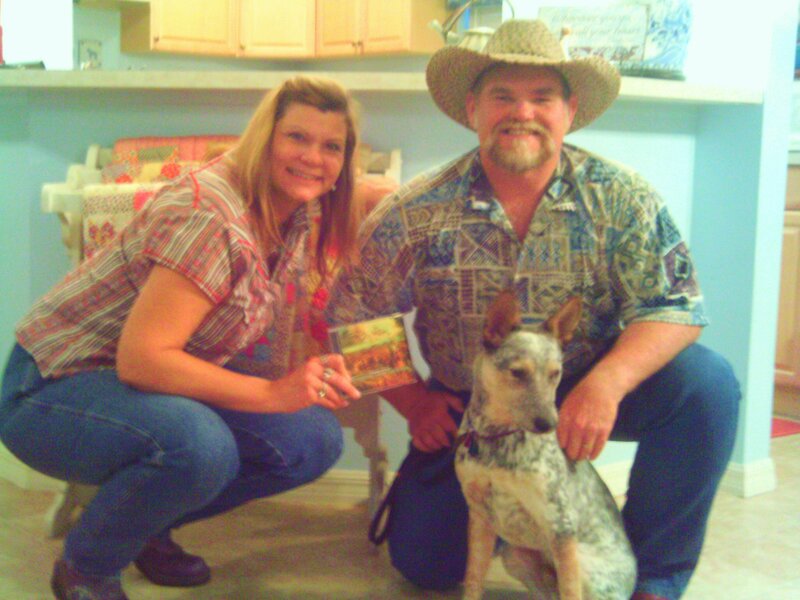 Cowgirl just left with the wonderful Sheldon and Anita Wynne of Vero Beach. 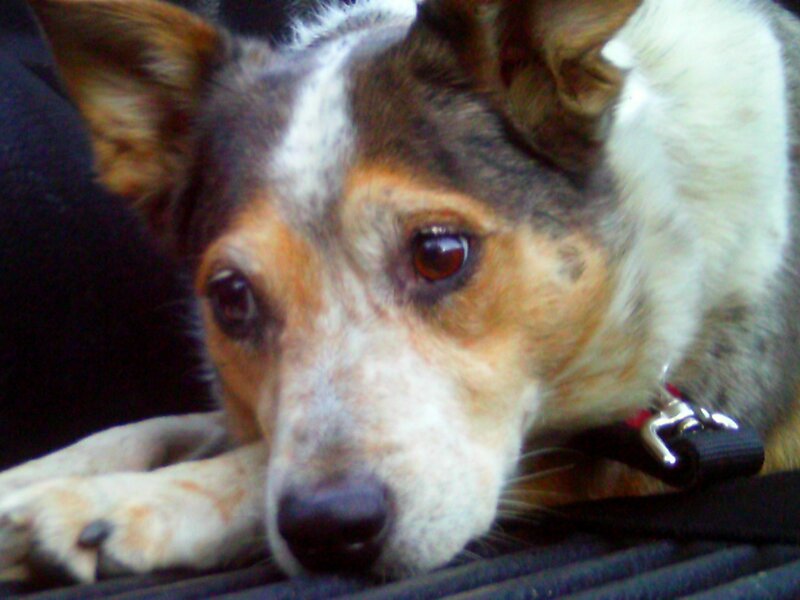 The couple lost their beloved 12-year-old Australian Cattle Dog, Cassie, about a year ago. 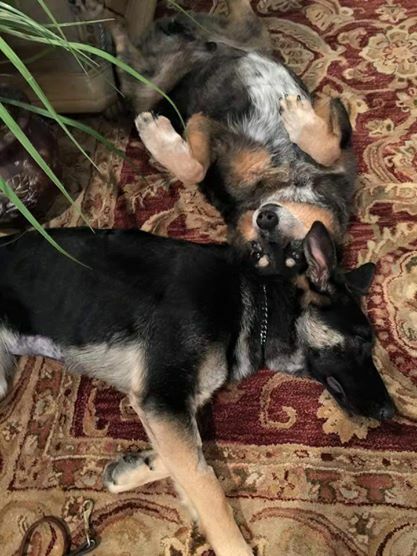 They and their 6-year-old lab have missed Cassie so much, they decided it was time to consider adding another ACD to the family. I think our gentle Cowgirl is the perfect choice, don’t you?!? 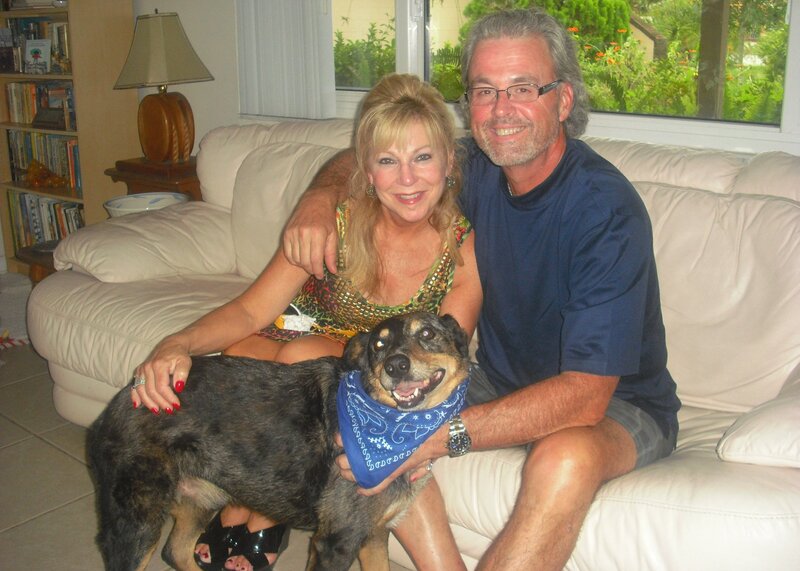 Vero Beach, welcome your newest Dog Liberator dog! Are we at Amy’s house yet? Cowgirl and her cowgirl gear. 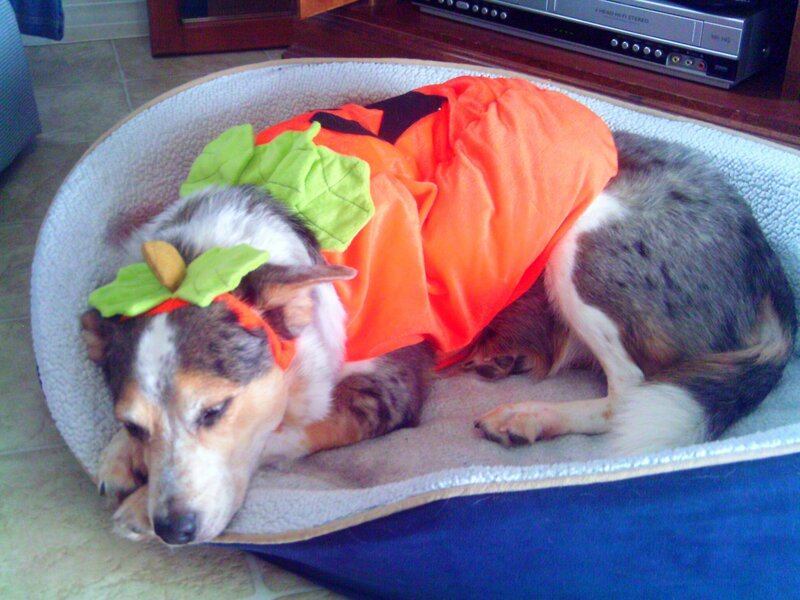 She’s super excited about Halloween. Trying to look diginified in Halloween pajamas. 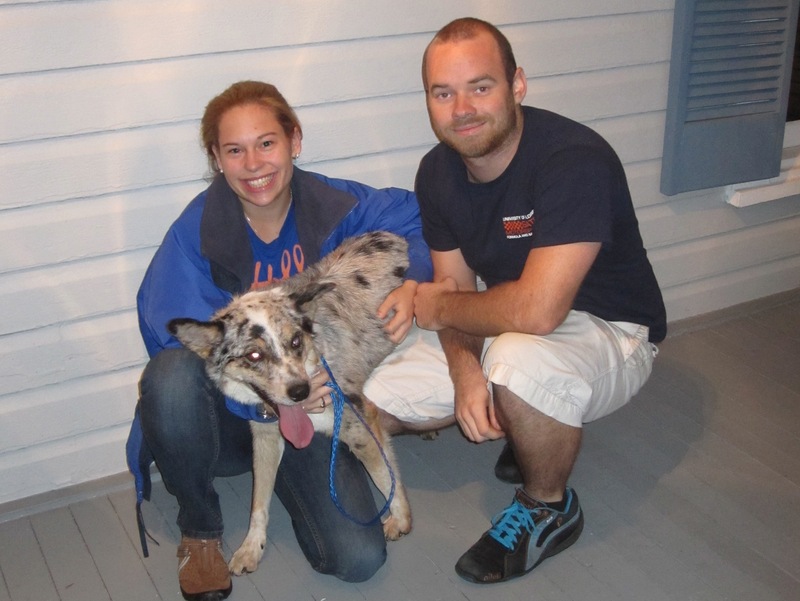 Happy days are here again for Fonzie, the Australian Cattle Dog (Blue Heeler)! 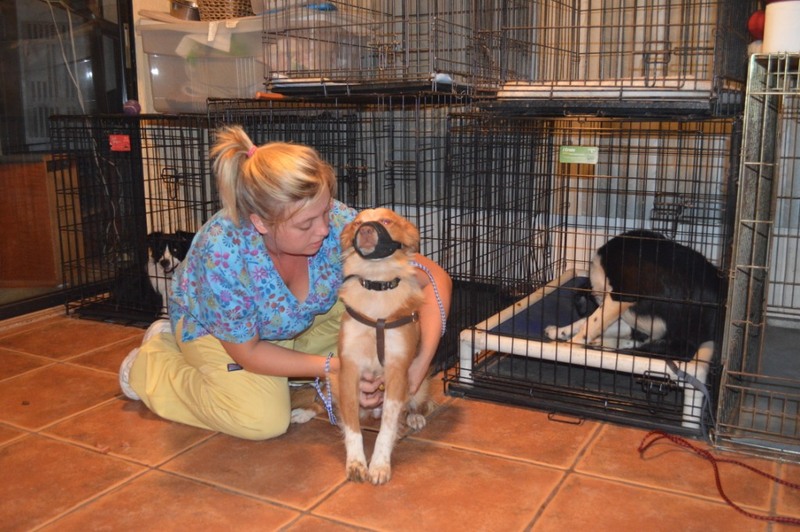 Fonzie and his transport buddies, Casey Rose and Rusty all came from Alabama where they were fostered by Deb Gaylord. 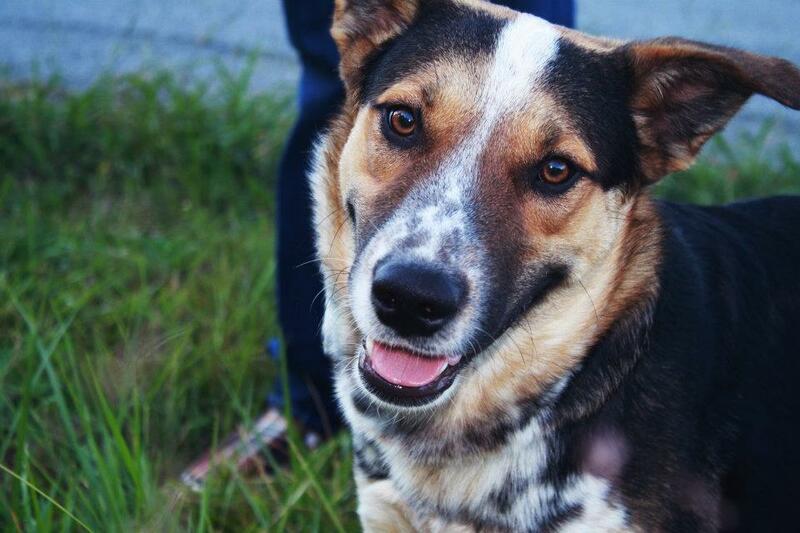 Fonzie was pulled from the infamous Athens Dog Pound, a notoriously high-kill rural shelter. Our boy was lucky to make it out alive and we’re so happy he did! 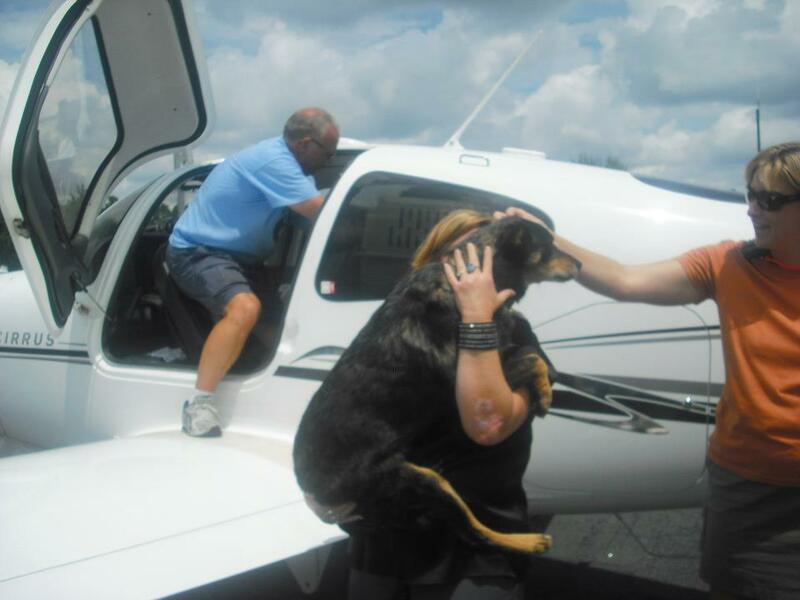 Fonzie and his pals were flown to us by Jeff Bennett, a volunteer for Pilots-n-Paws. 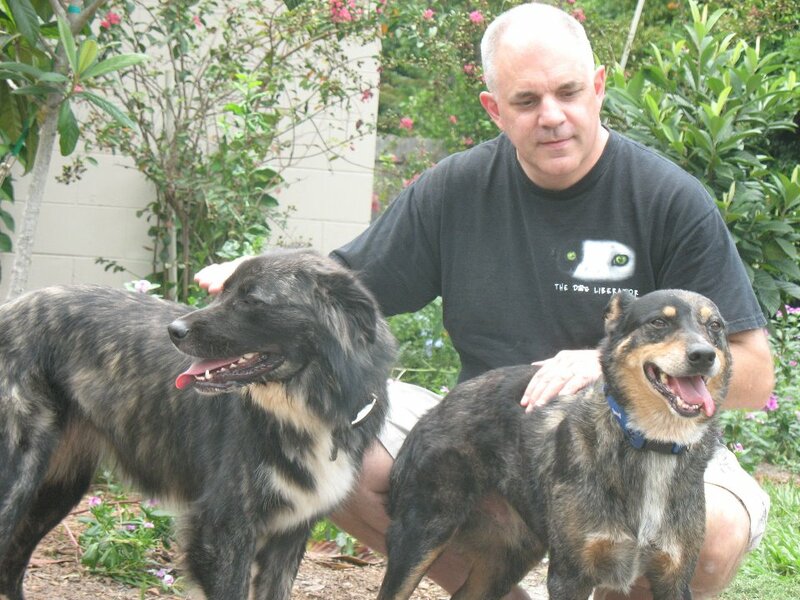 All three of the dogs have awesome temperaments, relaxed, calm, and happy to meet everyone. In the short time he’s been with us, Fonzie has demonstrated that he is a calm and affectionate fellow who wants nothing more than a human to call his very own. He’s also very good with cats and other dogs, is crate- and house-trained, walks very well on a leash, and enjoys riding in the car. We were told that Fonzie is around a year old, but we think he may be closer to 2-years-old after looking at his teeth. That, or he was tied outside on a chain for much of his young life and chewed on the chain from boredom, causing some wear to his teeth. In any case, Fonzie is a complete joy who — given the opportunity — will make someone a devoted and loving companion indeed. Fonzie is neutered, up-to-date on all his vaccinations, and heartworm negative. He currently weighs around 45 lbs., but could stand to lose a pound or two. But, hey … who among us couldn’t?!? 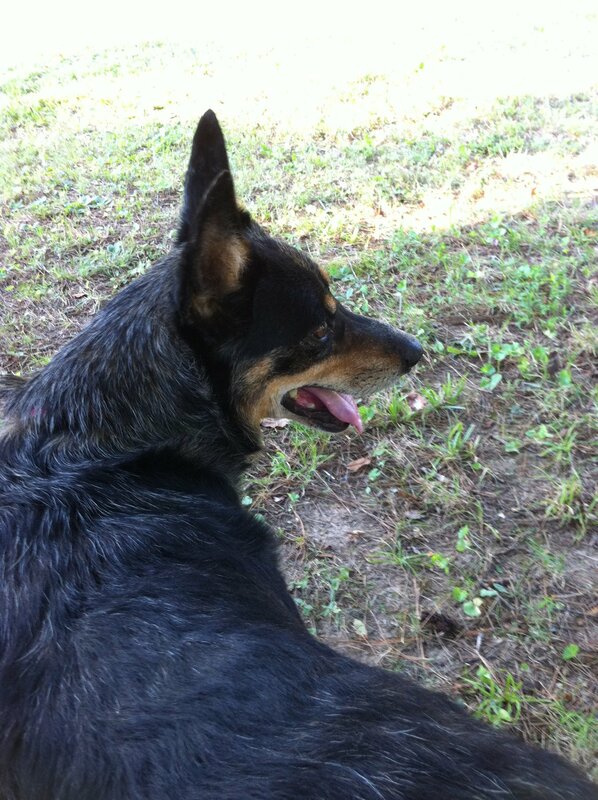 Fonzie is being fostered in the Ocala area, and updates will be coming soon! In the meantime, you can view his photo album on Facebook. If you are interested in adopting Fonzie, please review “How to Adopt From Us” and email your information to me at amyb.thedogliberator@gmail.com. 1/5/15 Update: Fonzi became a big brother to Tuesday, and it seems that he is welcoming her into the family with open arms. 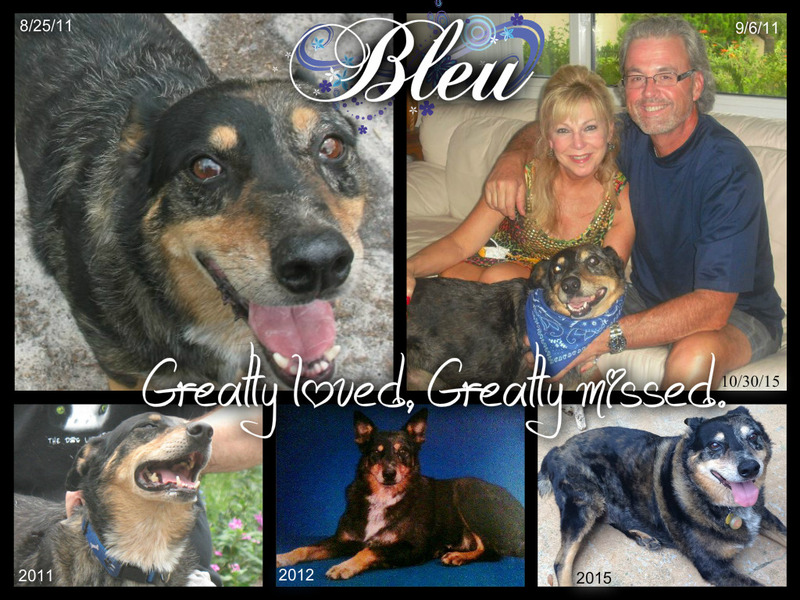 10/30/15 Update: It is with a heavy heart that we say goodbye to Bleu, (TDL’s Fonzie). 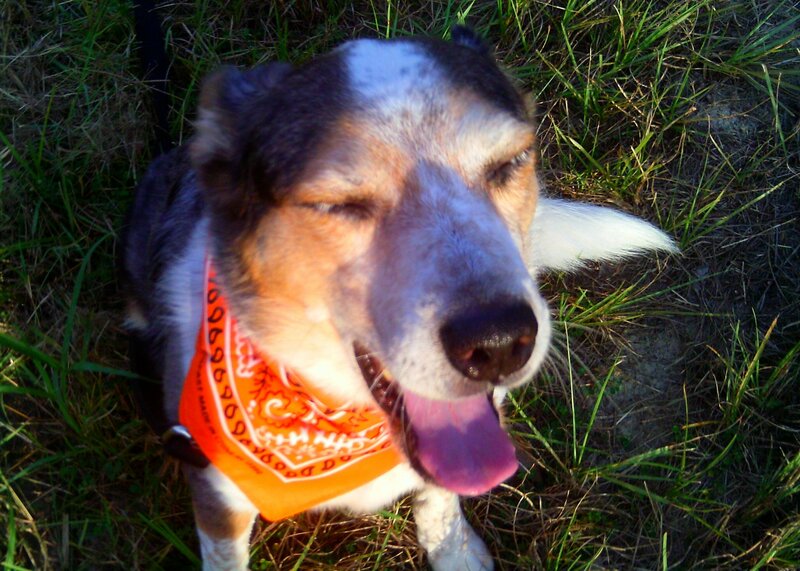 Our thoughts and prayers are with his loving parents, Belinda and Mike, and his doggy sister Jetta (TDL’s Tuesday) as they mourn the passing of this smiley boy. Meet Durango Molly, one of a litter of four we rescued last summer. 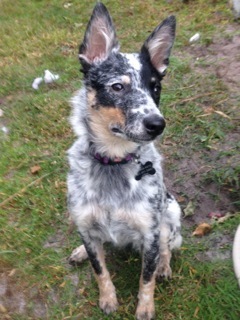 Born in June, her littermates have classic ACD markings, but she reached into the closet and put on the wrong coat! We think she may actually have some Italian Greyhound in her. She is petite – under 30 pounds and just under knee-high. She was adopted into a wonderful loving home but do to changes in their situation, she is in need of a new home. The good news is that they have done wonders with her and she is fantastic! Molly loves to sit on your lap, loves to chase a ball, catch bubbles and has already learned simple behaviors such as sit, shake, lay down and catch (if it is food, she almost never misses!) Her favorite treat is ice cubes and she will run for the freezer if anyone is getting ice. She has a real passion for having her neck scratched and if you get her in just the right spot, she melts onto the floor in a puddle of fur! She walks well on a leash and loves riding in the car to the park. She is completely house trained and crate trained and never fusses when in her crate. Bedtime is 10:00 p.m. and she knows the routine – one more time outside, then in her crate, a few Cheerios, her sheet goes over the crate and then it’s all quiet until 7:00 the next morning. Even if there is a lot of noise around her, she never makes a peep! Molly has lived with a family of seven, including children ages 6 to 20, plus with two other dogs, and she has been a joy. If you are looking for a sweet easy-going little girl, then Molly is waiting to be your forever friend. Be sure to check out Molly’s photo album. These days, cutbacks are a fact of life for many Americans. For Catfish’s former owners, the poor economy and a resulting job loss meant cutting back on the number of animals they had. The youngest, most adoptable member of their pack was 9-month-old Catfish, so they asked us to find a wonderful new home for him. No problem, we said. After all, we specialize in finding great homes for our dogs! I don’t forsee that finding a forever family for Catfish will be difficult. He’s super cute, he’s friendly, he’s smart and fun-loving … doggone it, if he were a guy instead of a puppy, reality shows like “The Bachelor” would be blowing up his BlackBerry! Oh, and did I mention that Catfish has a great work ethic? At his previous home, his job was to round up the horses for their morning and evening feedings. He also was in charge of keeping the horses from pawing at the gate and fencing. “Get ’em off the fence” was all he had to hear and Catfish made it happen. He’d love to have a job again. 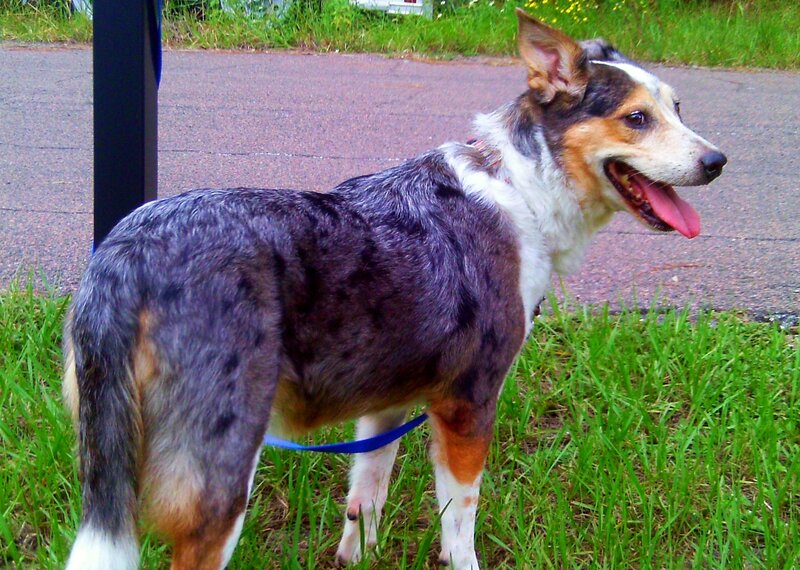 As smart and energetic as he is, I bet Catfish would be great at disc dogging or agility, if that’s your thing. An active family would also enjoy this pup, as he’s good with children (his former family had a 5-year-old and a 6-year-old). 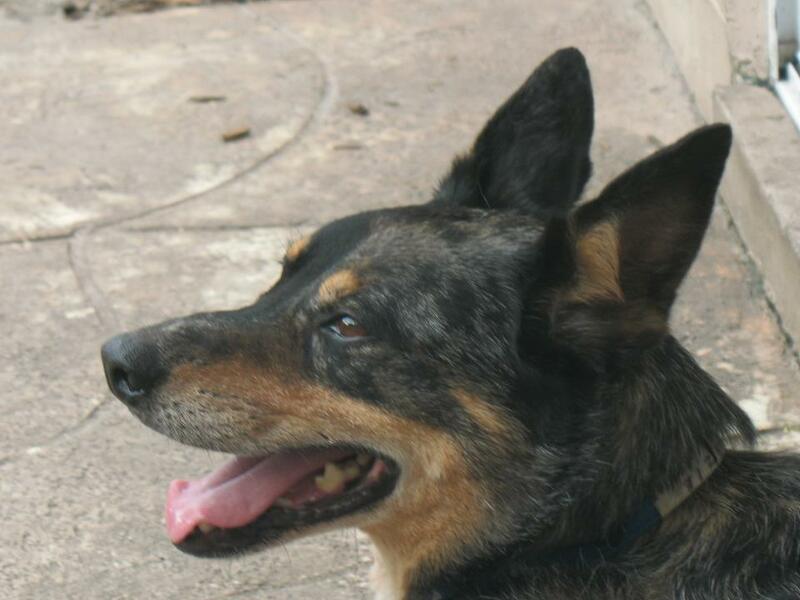 In fact, Catfish is actually quite submissive and loves people and other dogs, putting to rest the myth that Cattle Dogs are aggressive, snappish dogs suitable for one-dog households only. This boy loves everyone and really just wants some attention and a playmate. 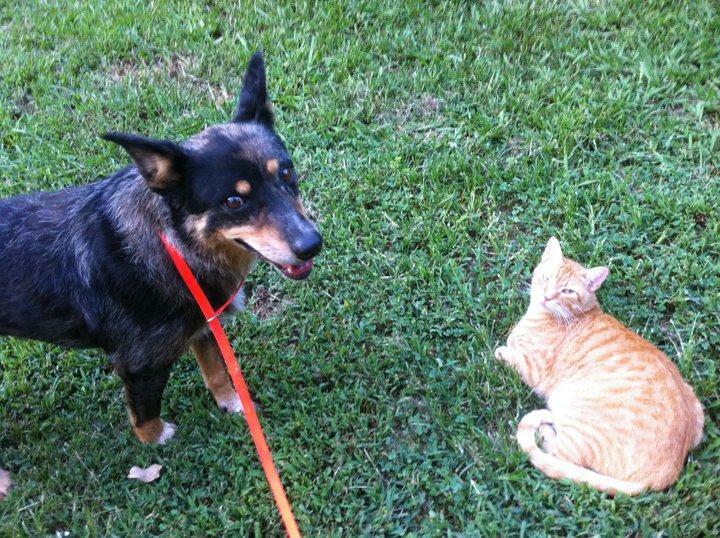 Catfish is currently being fostered at my home in the Ocala area. He is crate trained, and we’re working on house training (so far, so good!). Catfish does like to chew (he is still a puppy, after all), so I make sure he has a beef marrow bone or cow hoof or other acceptable “chew toy” available at all times when he’s inside. And he loves to ride in the car. Catfish is neutered and current on all his vaccinations and heartworm/flea preventative; he weighs approximately 30-35 lbs. I’ll be posting updates to his foster diary periodically, so be sure to check back often. In the meantime, make sure you look through Catfish’s facebook photo album. If you think you might be interested in adopting Catfish, please first read our page on Starting Your Dog Off Right, then review our Adoption Process and e-mail me at amyb.thedogliberator@gmail.com.